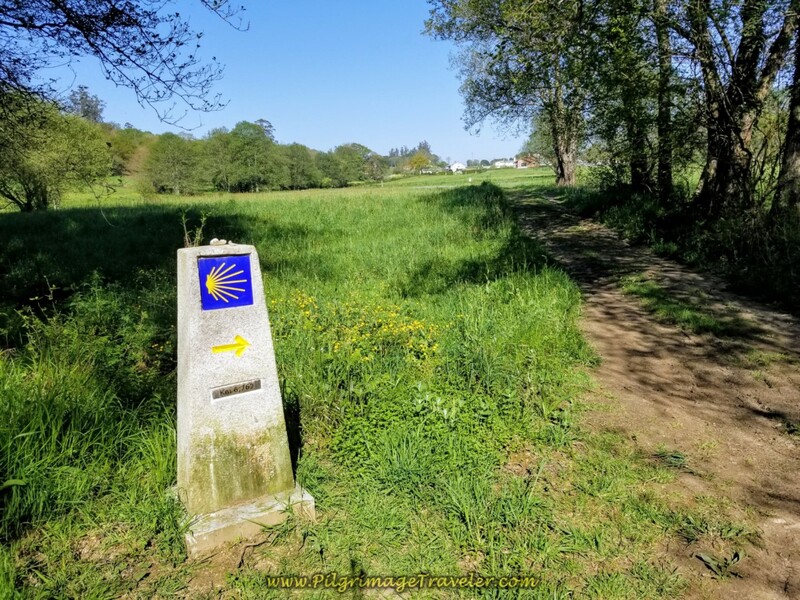 Our day eight on the Camino Inglés felt more difficult than perhaps it should have, due to the fact that there are not many attractive features on this day and there is some significant climbing that has to be done. 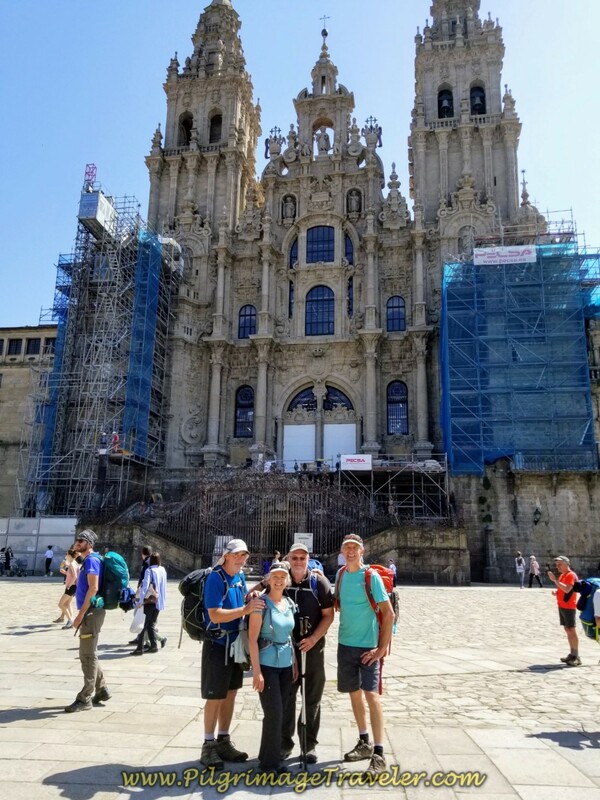 We were going to make it to Santiago, regardless, and all of our spirits were high. There are however, enchanted forests to walk through, so keep your eye out for special encounters! 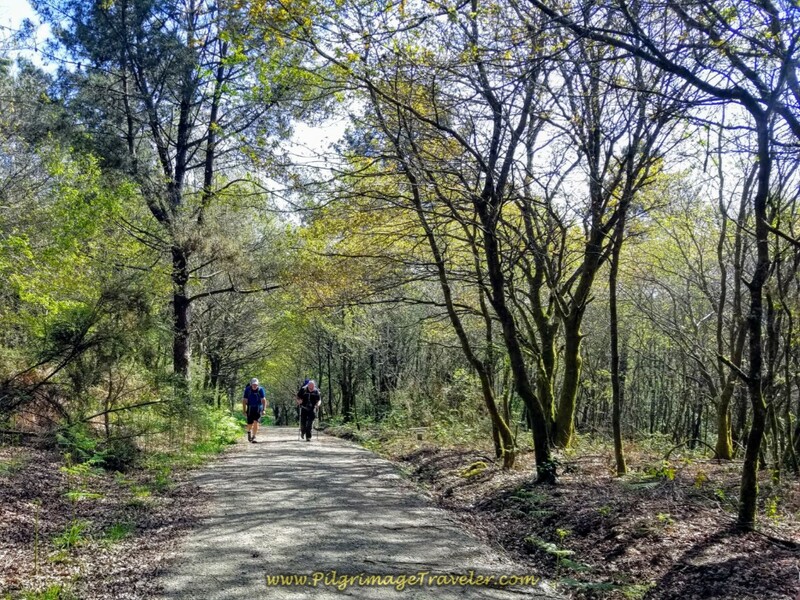 The new route out of Sigüeiro is almost entirely different than it was prior to 2017. For those of us who have walked both, the jury is out on which is the better way! Here is our map of this final day, uploaded to Google maps from our GPS tracks. 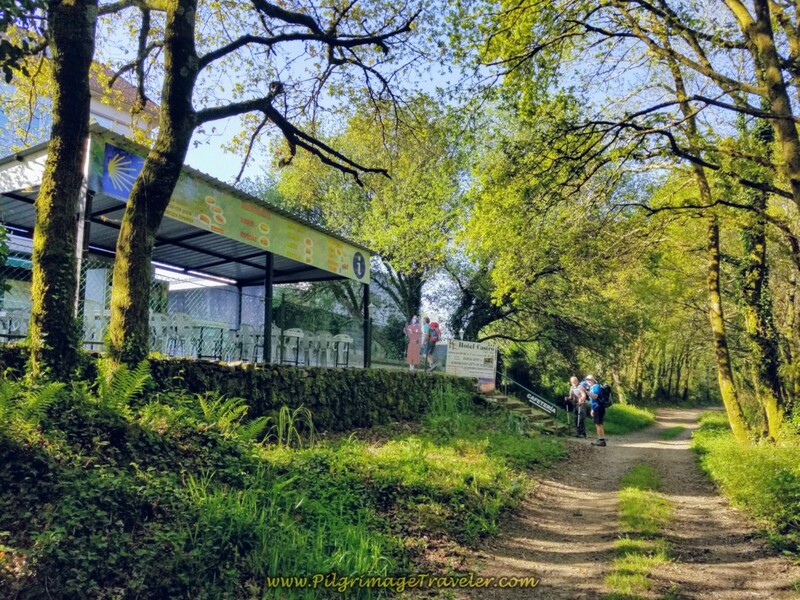 There are several significant climbs on this day, the first out of Sigüeiro, the second at about 7.0 kilometers into the day, and a final climb at about 10 kilometers. It is not an easy day, by any means, with an altitude accumulation and loss of over 400 meters (over 1300 feet). 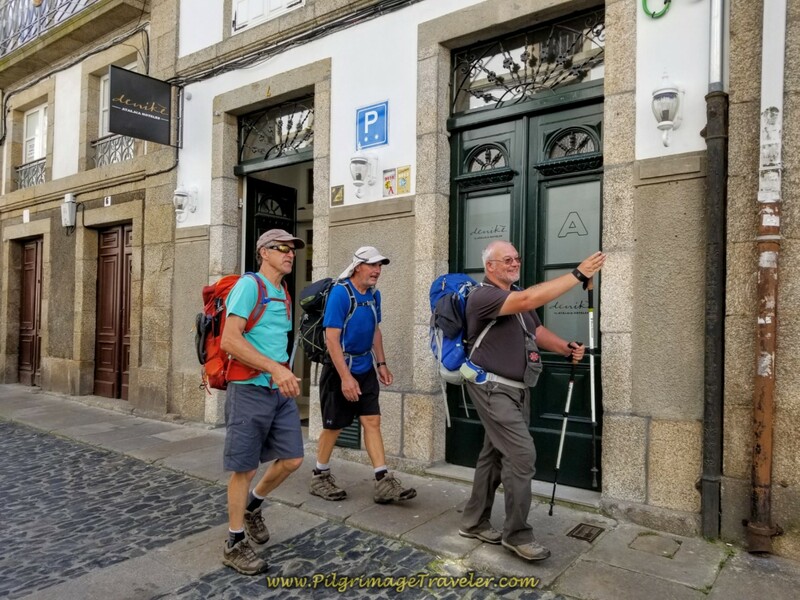 After our lovely and filling continental breakfast at the Albergue O Fogar da Chisca, we started out on the Rua Camiño Real in the center of Sigüeiro. 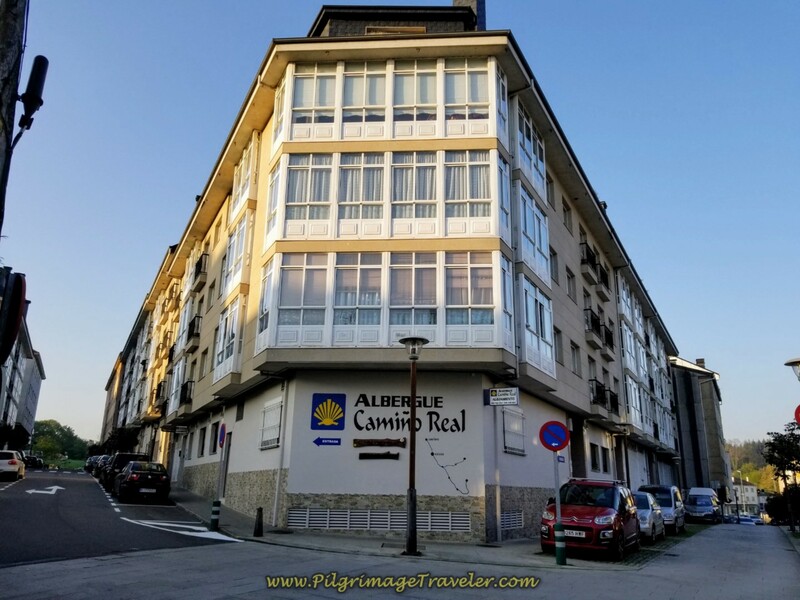 In our first 200 meters of walking, we passed by the large Albergue Camiño Real. 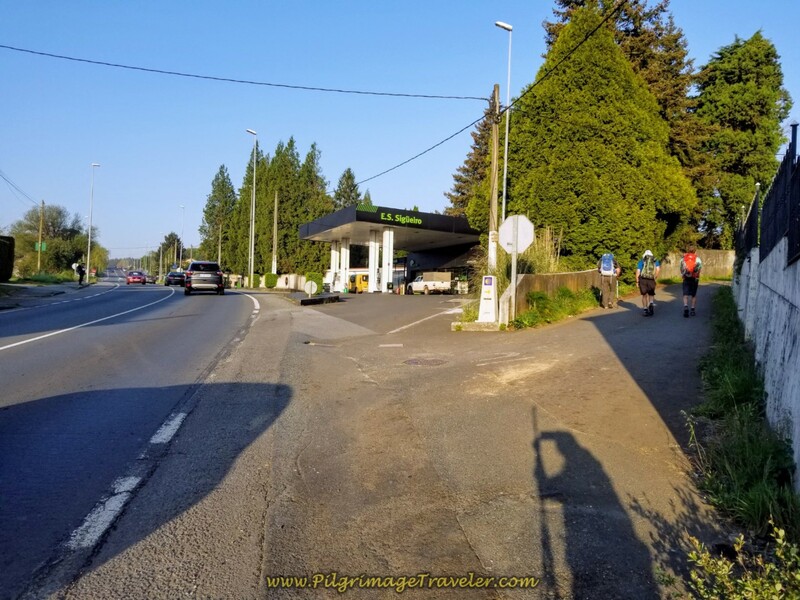 Just after the albergue, you come to a T-intersection with the N-550. Turn left at the Restaurante Vda. De Nouche onto the N-550. There were lots of rushing trucks at 7:30 in the morning! 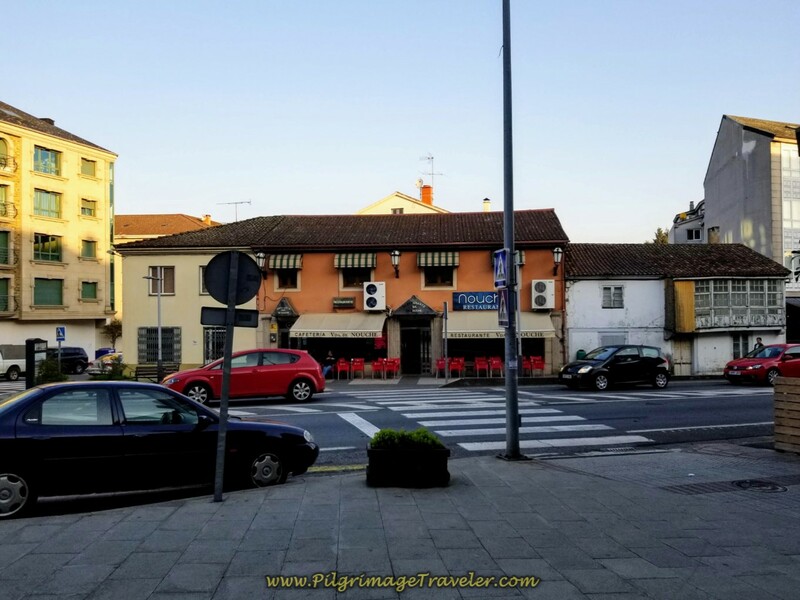 At this same intersection, you pass by the Albergue and Café Restaurante Mirás, on the corner, shown below. In another few hundred meters, come to the bridge and cross the Río Tambre on the N-550. 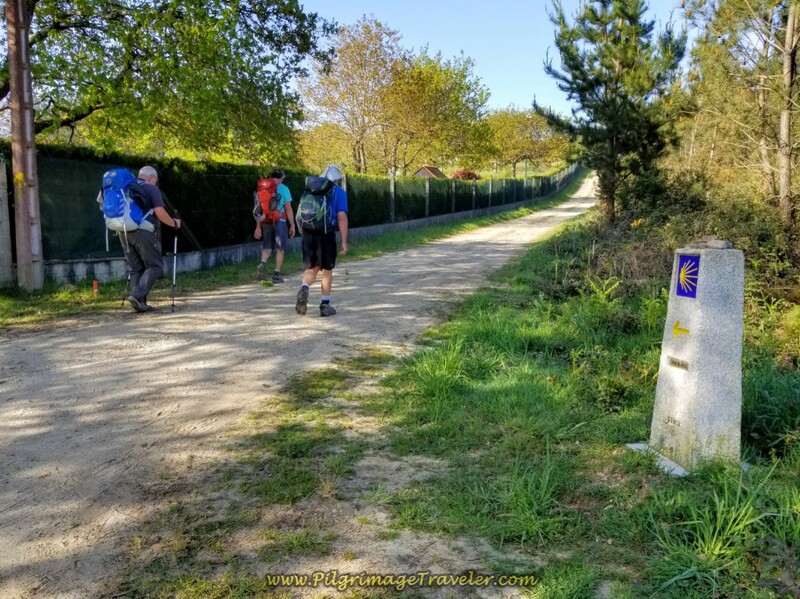 Day eight on the Camino Inglés essentially follows the path of the N-550, but only rarely walks along it, except for brief sections. Just after the bridge, your next move is to the right, where you turn just before this gas station, shown below. 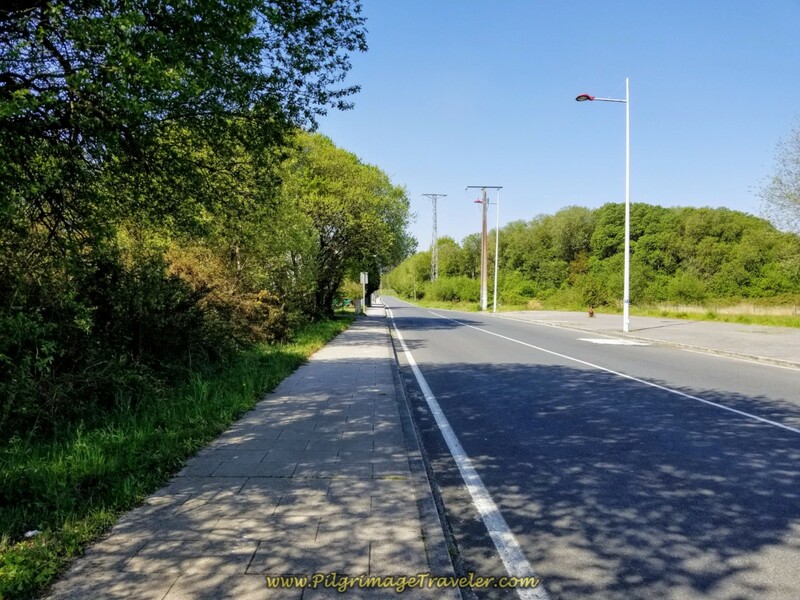 The directional waymark is hard to find, and when you finally see it across the street, you are not at a convenient place to cross it. We had to retrace our steps to find a safe crossing with all the rushing traffic. Look for a crosswalk, anytime after the bridge. You have about 400 meters before the turn. Plus, I was fooled, because I actually remembered the old route took a left here off the N-550! 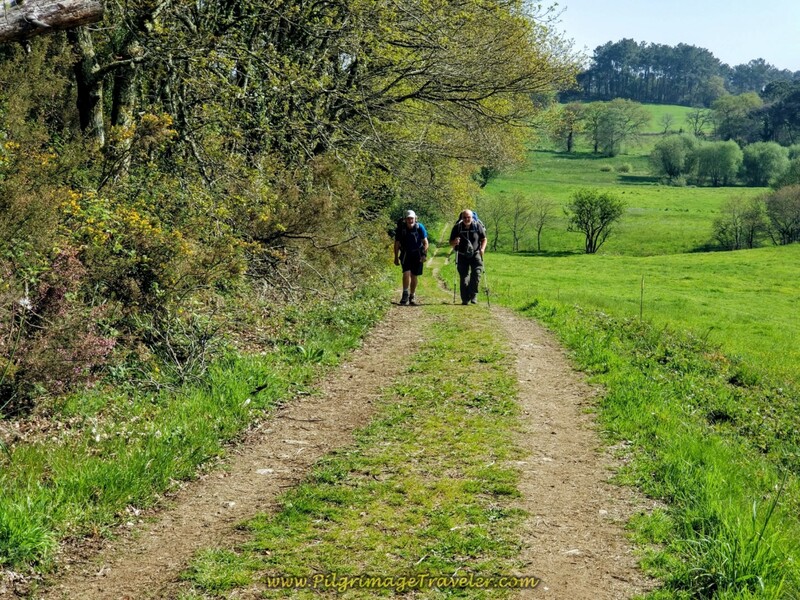 Once leaving the river, the Camino climbs slowly and steadily in the next four kilometers. This does not feel all that strenuous, at least it didn't to me. It is the uphills later in the day that felt harder and steeper to me. 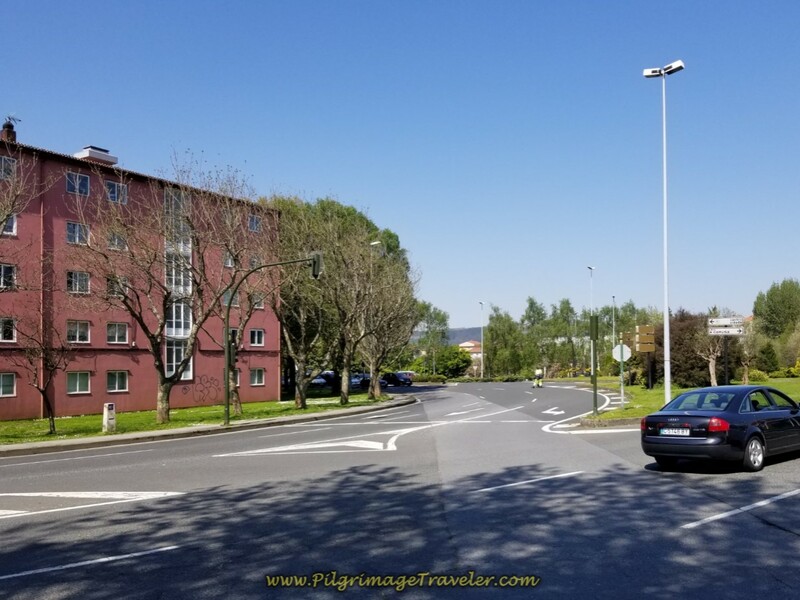 Walk only about 150 meters from the N-550 and you make a left turn in O Valado, shown here. 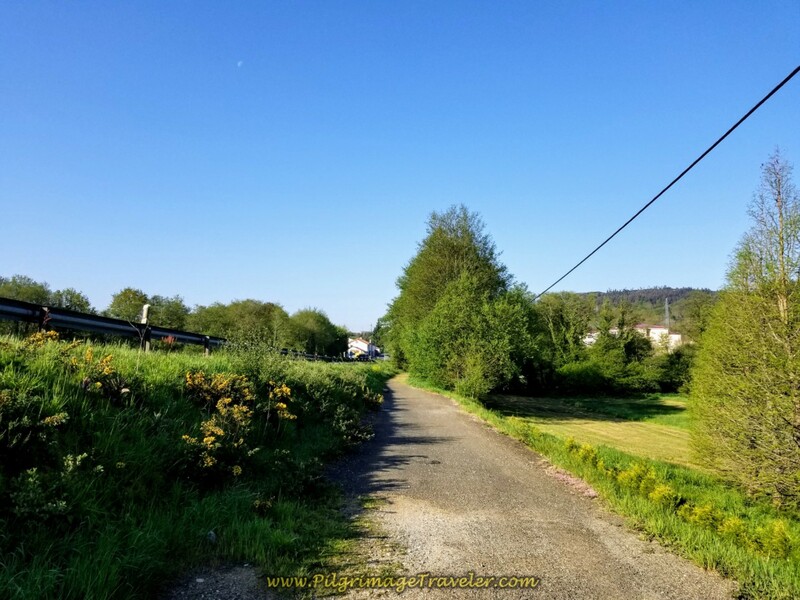 This paved road, is nice, quiet and rural place to walk. It was fresh and cool on this morning in May. 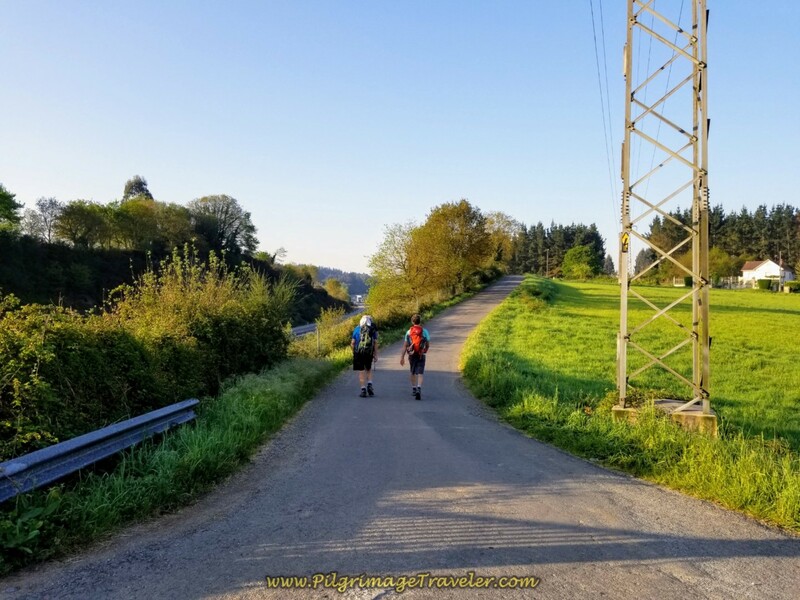 In about 1/2 kilometer on this road, the Camino leads you to a right turn. 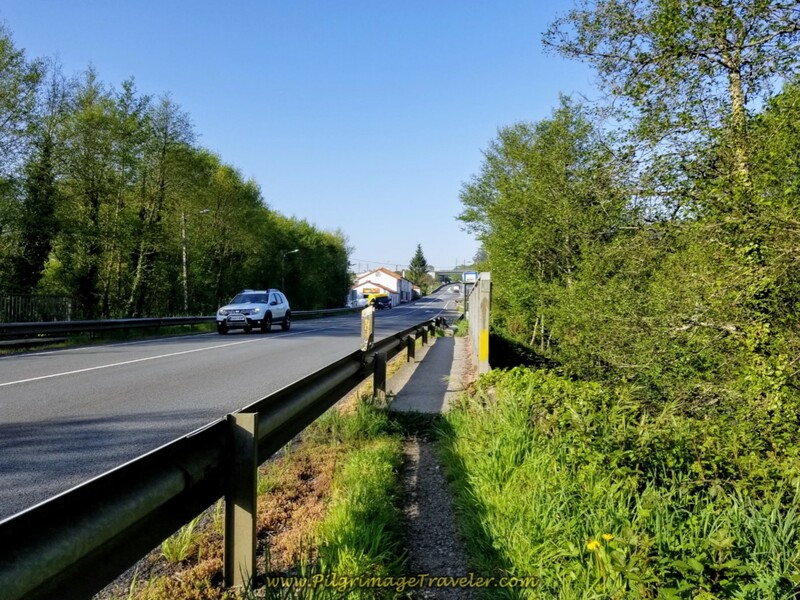 In a few meters more, you cross the E-1 and turn south to follow it on a frontage road. I thought, oh no, not a repeat of day seven, following along the motorway again! 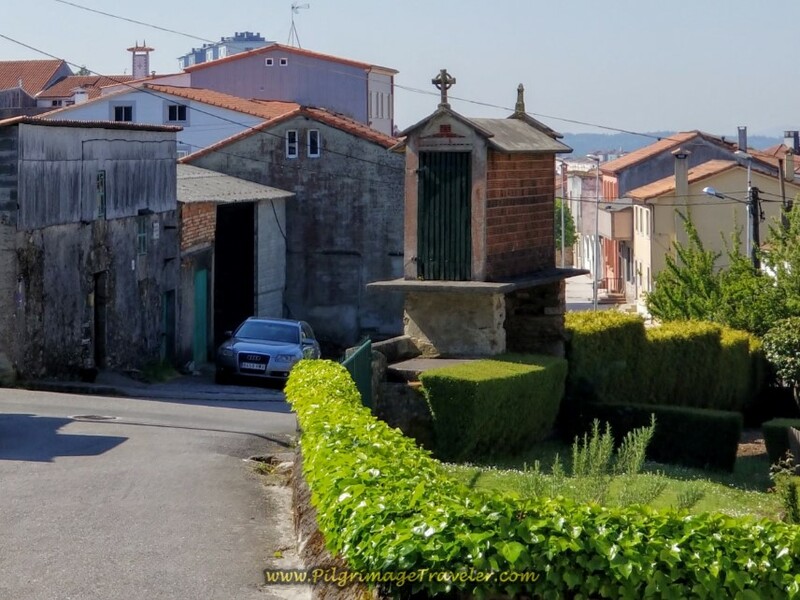 Luckily, in only 150 meters, the English way turns right off the frontage road, and heads toward the hamlet of Vila de Marantes, shown below. 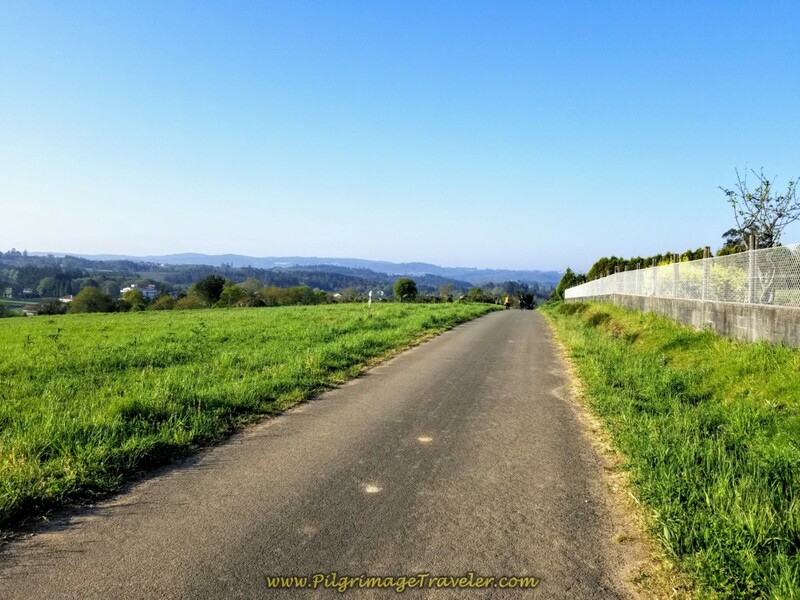 In another 150 meters the Camino turns south on this lovely lane as it passes by the 13.96 kilometer waymark. We walked along this lane for about 2/3 kilometer, turning right onto pavement at the end of the lane. 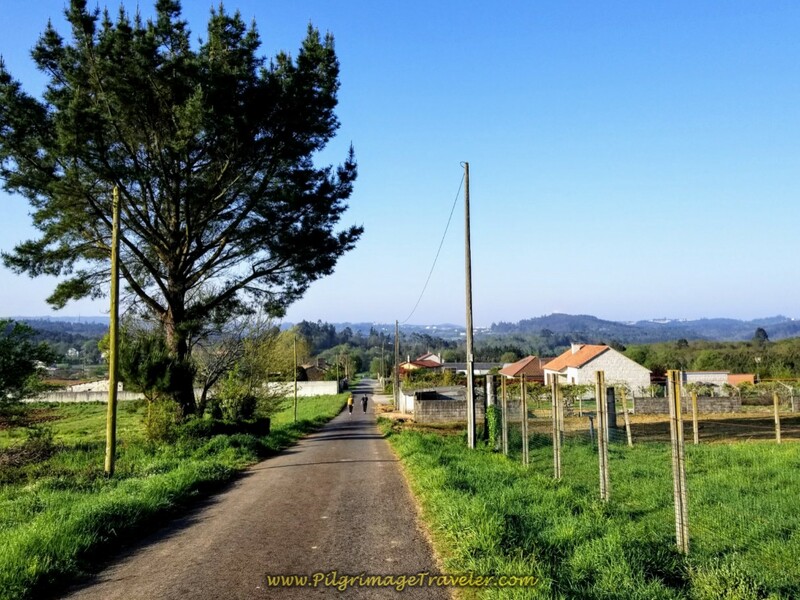 In only a few more meters, the Camino turns left toward Vila Fernández, shown below. 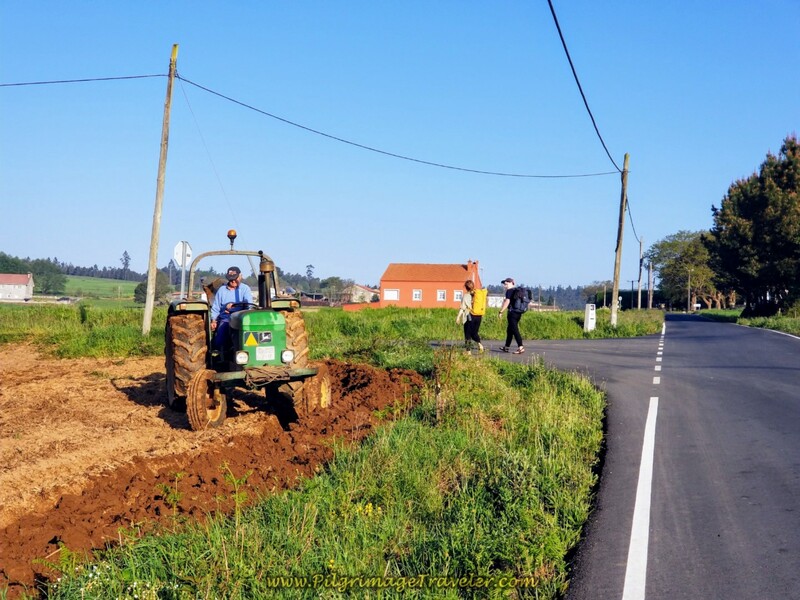 We caught up to and followed two peregrinos at the turn, with a farmer busy plowing his spring fields. 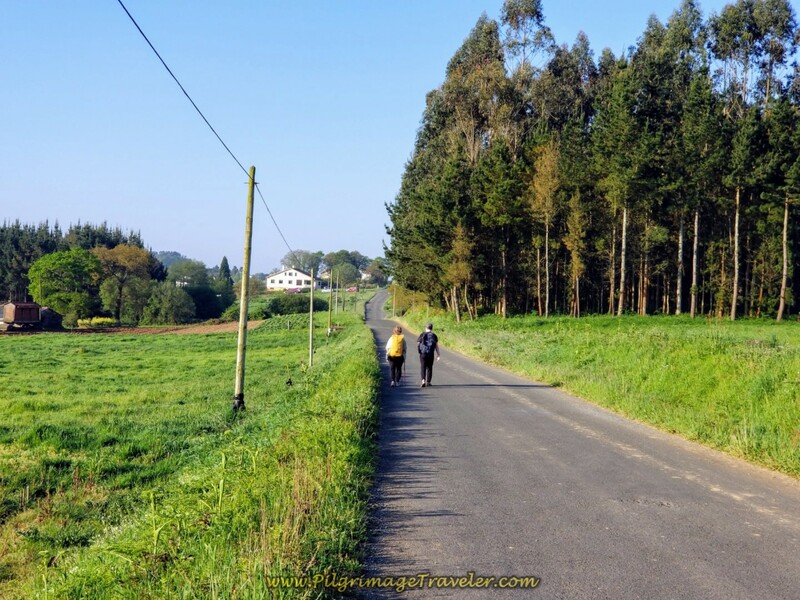 It is a nice walk on this paved road, through the next hamlet of Cortos, for a bit over a kilometer. Then you take a short jog to the right. 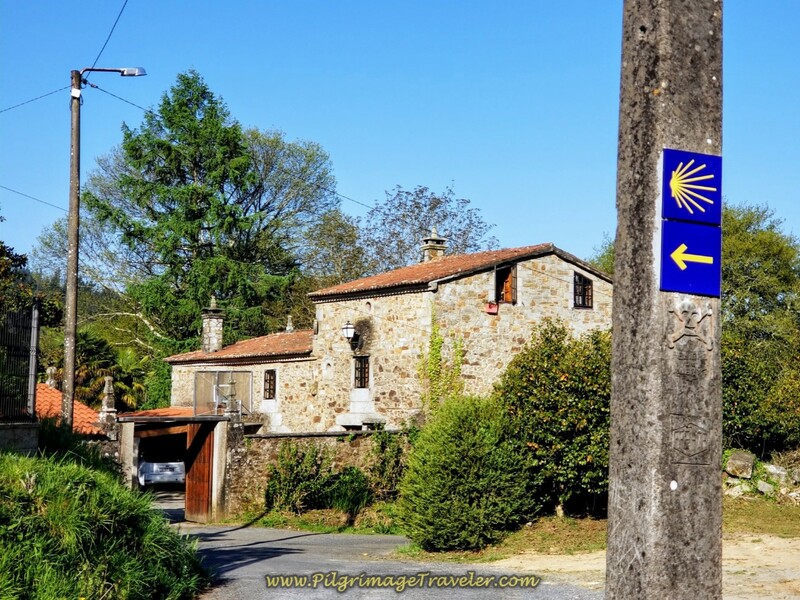 Another left onto the Lameira road, below, brings you into the next hamlet of Lameira, passing the 11.82 kilometer marker on the way. 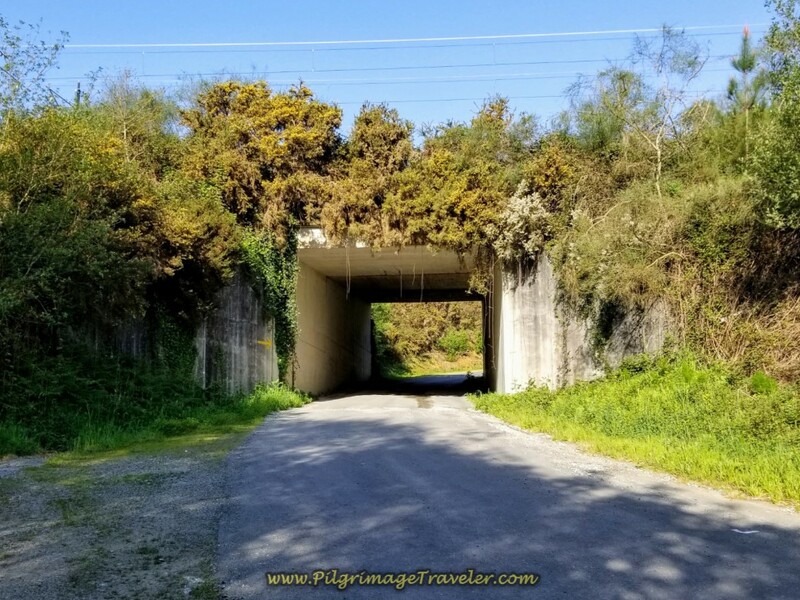 In 3/4 kilometer, after walking through Lameira, the road turns to dirt and the lane bends back eastward toward the N-550 again. 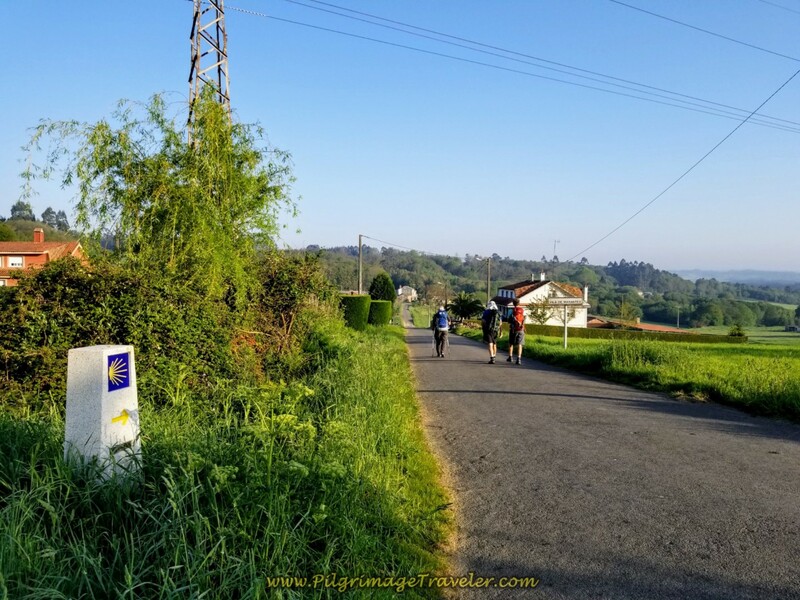 The Camino winds around on the dirt lane for about one more kilometer, avoiding the N-550 and comes out to a paved road and turns left. In about 200 meters on the paved road, you finally do come to the N-550. However, fortunately the English Way takes a turn to the right to access a nice road that parallels the N-550 instead. 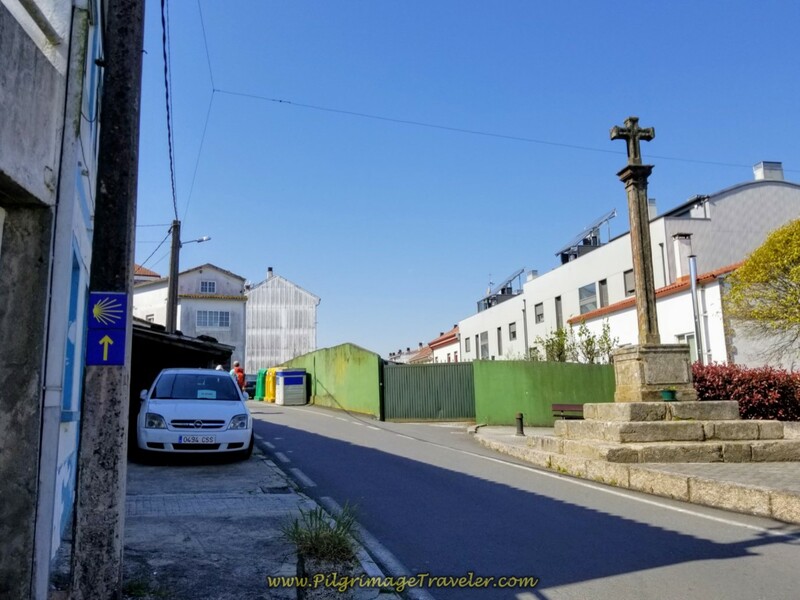 This attractive little diversion on the Sionlla Abaixo street, through a small hamlet is one of the few quaint areas on day eight of the Camino Inglés. 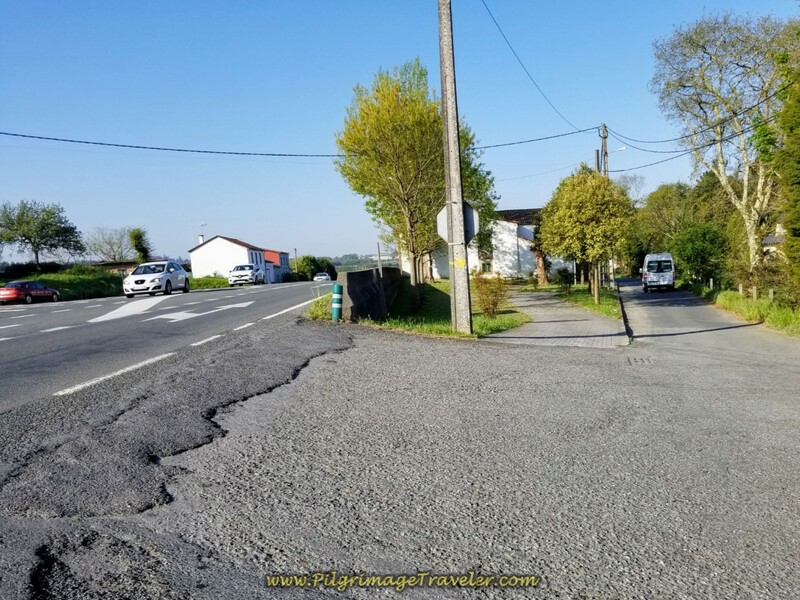 But the quaint diversion does come to an end, after a brief 400 meters or so, where the road joins the N-550 and walks alongside it. The road leads into a path along the N-550 and crosses the Río Sionlla. 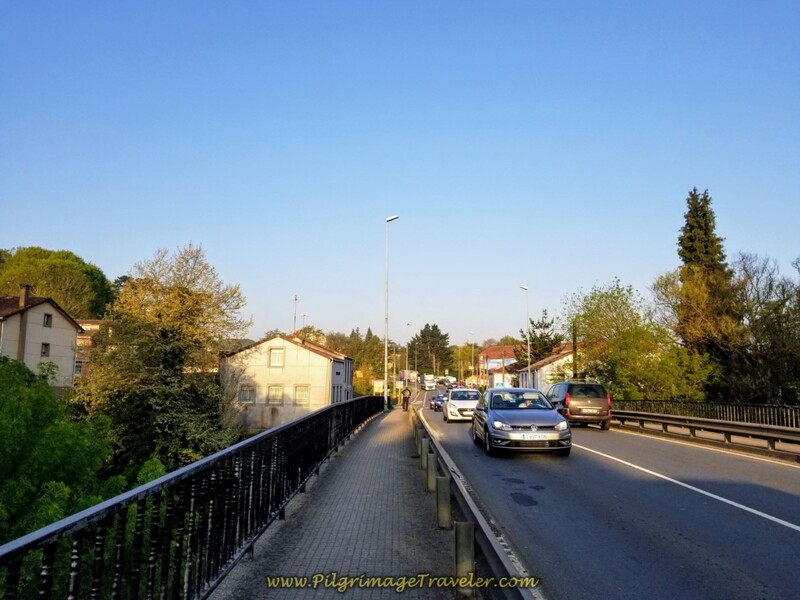 Fortunately, you only walk for about 300 meters on the N-550, before the Way takes the first right after the bridge, just before a restaurant. 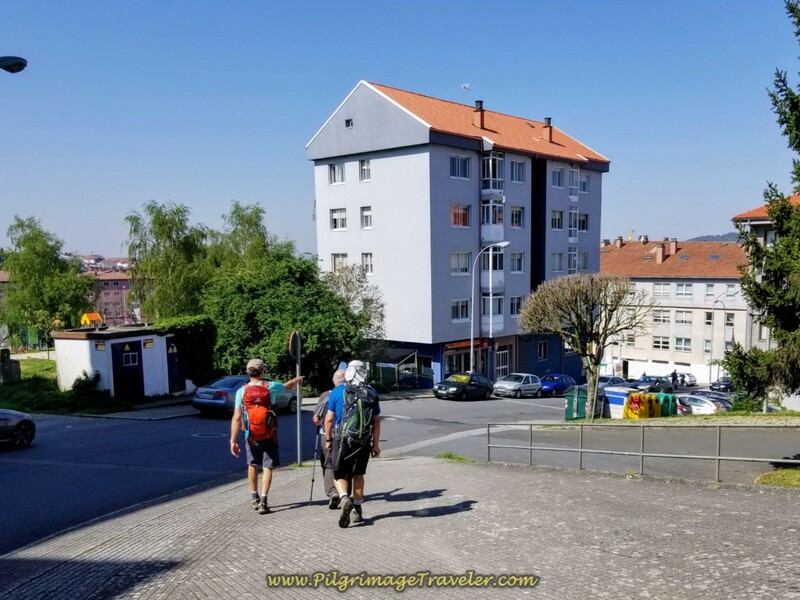 Continue on by a school and walk under the railroad tracks, beginning a long climb up a steep hill on the pavement. 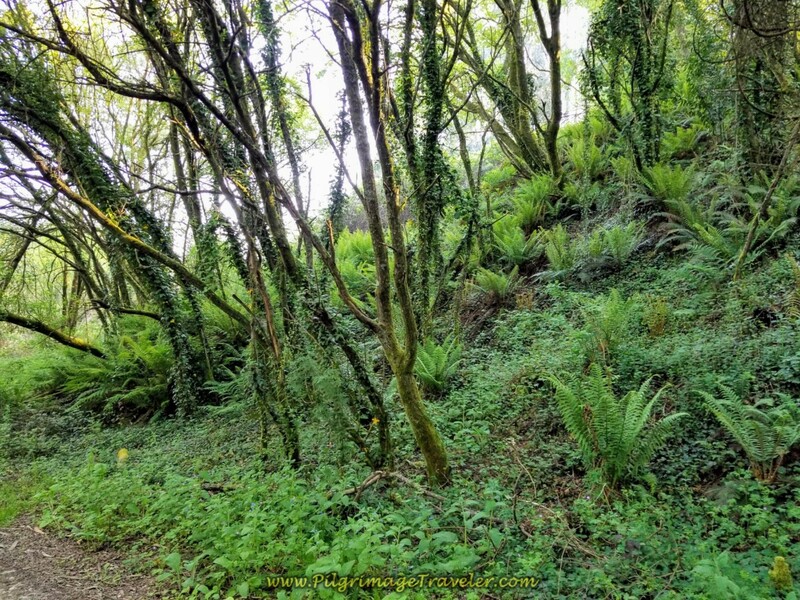 At the end of the pavement, turn southward onto another dirt lane and continue climbing. Pass by the 8.9 kilometer marker, shown below. After 1.2 kilometers, take a right turn here on another dirt lane at kilometer marker 7.77 in an area called Formarís. 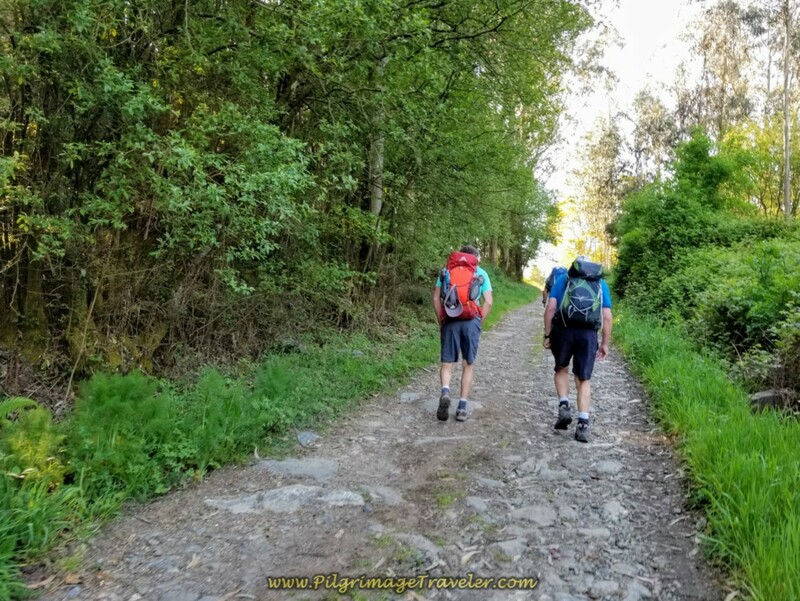 We continued following the path of the N-550 for the day, just staying to the west of it on these forested lanes. Walk through more gorgeous forest and come to the Café Bar Hotel Castro in about 1/4 kilometer after the turn. You can get a room for 20% off by showing your credential, get a buffet breakfast, bocadillos and whatever else is on the menu. 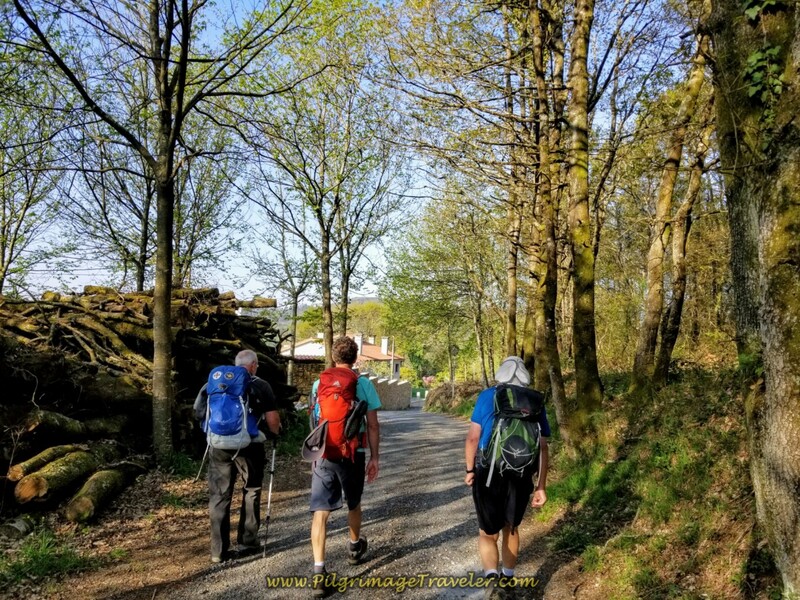 We decided to have a stop, at this approximate halfway point into our day eight on the English Way. We decided to sit indoors, since it was already a hot day, but they have lovely outdoor seating as you can see. After our break, we continued on the forest path. 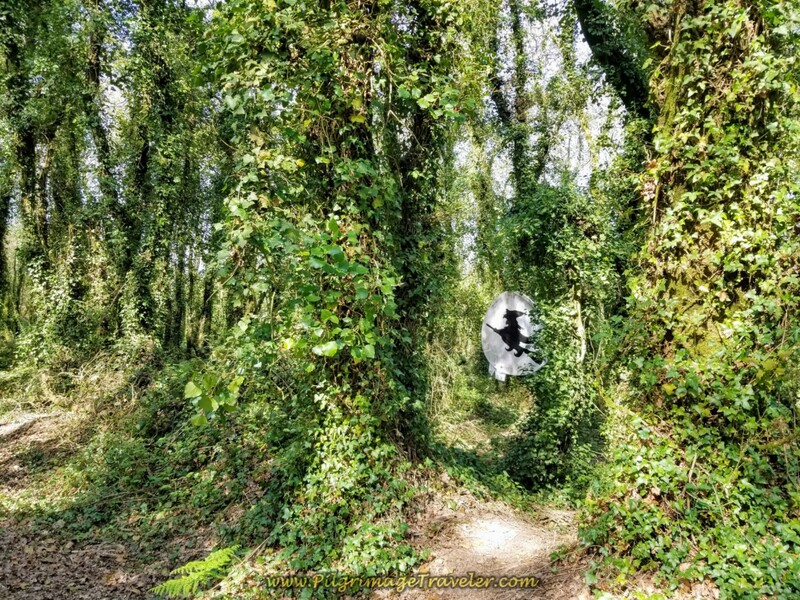 I guess the forest is actually enchanted, as we encountered a witch along the way! 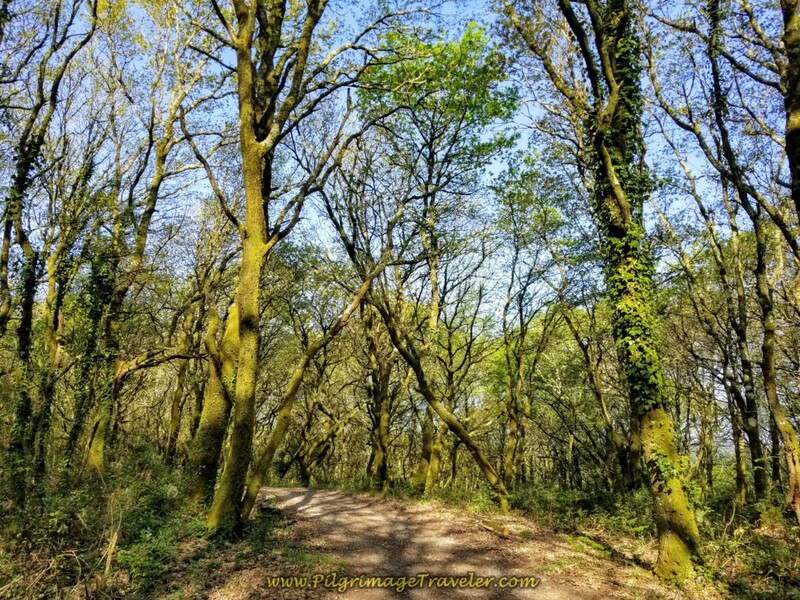 This is Galicia, after all and witches abound! But I have often been ensured by the locals that there are only good witches in Galicia that bring you luck! In about 600 meters after the Café Bar Hotel Castro the forest opens up to the fields at this kilometer marker 6.76, yet the nice farmer's lane continues. There are not very many kilometers left to go! After our coffee and cake break, we were walking a bit lighter. 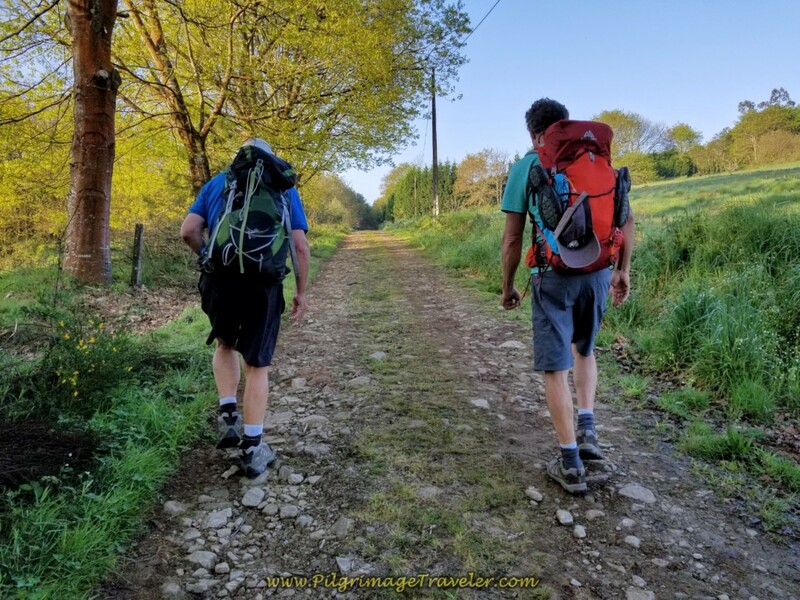 And thus begins the final climb of day eight on the Camino Inglés. None of us wanted any more climbing, but the pilgrim always takes another step, and then another. Then another step, we took, continuing on for the better part of a kilometer more of climbing. At least a portion of it was in the shaded forest. 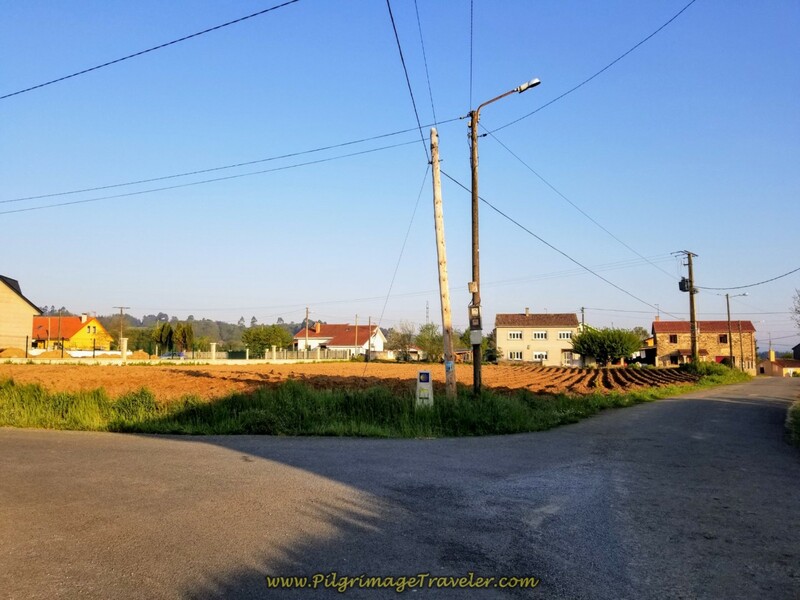 When you see a long, tall hedge on your left, and buildings ahead, you have come to the end of the climb and the end of the nice rural lanes. 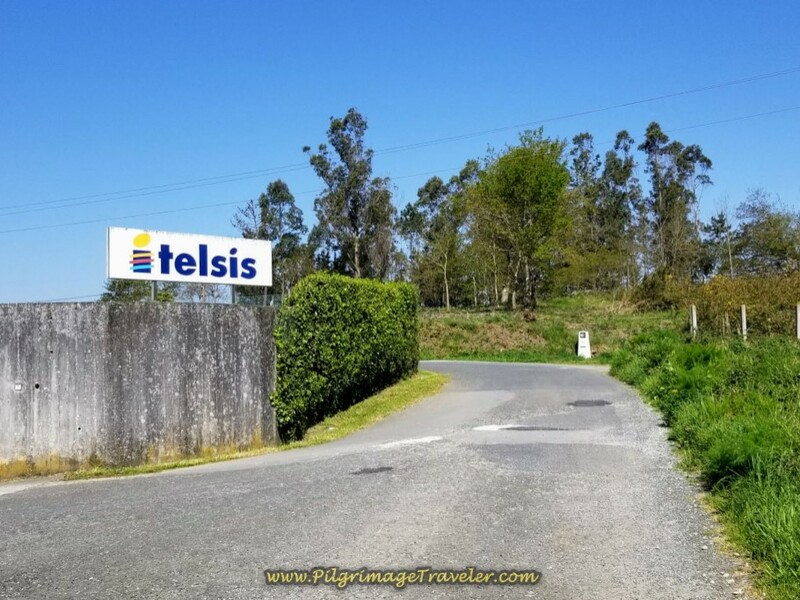 You are now entering the industrial park on the outskirts of Santiago de Compostela. 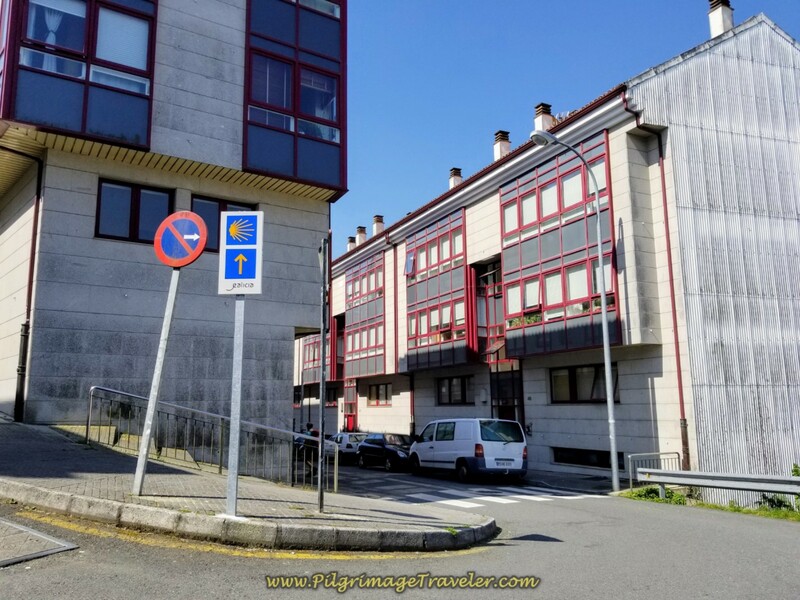 The Camino joins the pavement at the Itelsis building and just beyond it brings you to an intersection, below, where you turn left. This is where the old way now joins the new and improved one, since coming out of Sigüeiro! 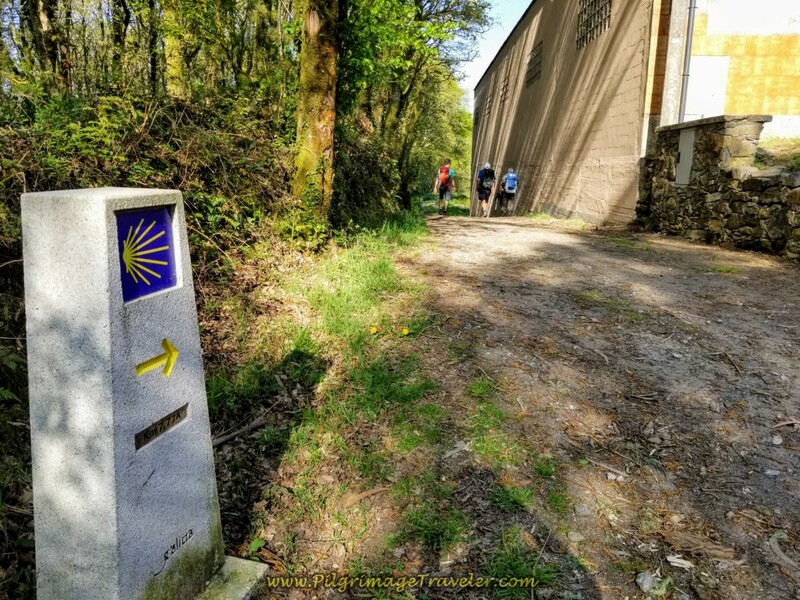 The Camino is entirely unique up to this point. More major changes along the Way in 2017/2018. 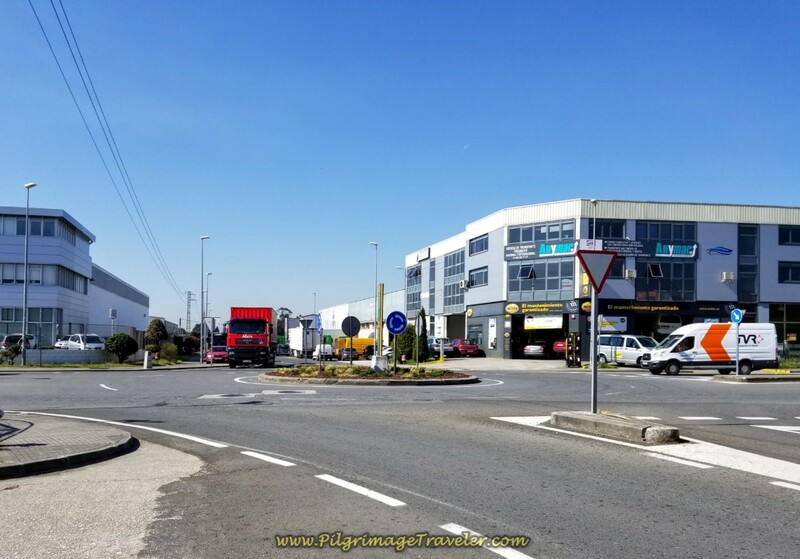 While the new route is shorter and more direct than the old, the Camino planners couldn't figure out a way to entirely avoid walking through the industrial park. Too bad. They did however figure out a way to make it briefer than the previous route. In a few meters you take another left and walk through two very busy roundabouts. After the roundabouts, stay straight on and leave the industrial park on this paved road. After about 1.5 kilometers more, the road merges with the Rúa do Tambre at the Café Bar Miro. 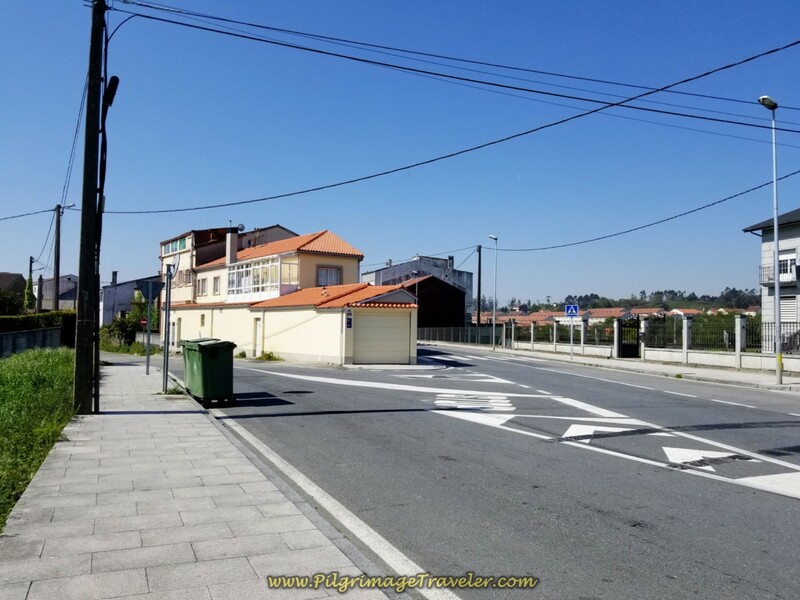 After only a few hundred meters of walking, leave the Rúa do Tambre at the Y-intersection here, and pick up a very quaint side street to parallel it called the Rúa do Meixonfrío. Re-join the Rúa do Tambre after only 1/3 kilometer. Two hundred meters onward, walk up and cross over our old friend, the N-550. Pass the 3.0 kilometer marker on the other side of the N-550. Wow! There is that much longer for city walking? Santiago is a a big town. The good news is that you must find yet another side street to make the city walking more pleasant, called the Rúa de Mallou. 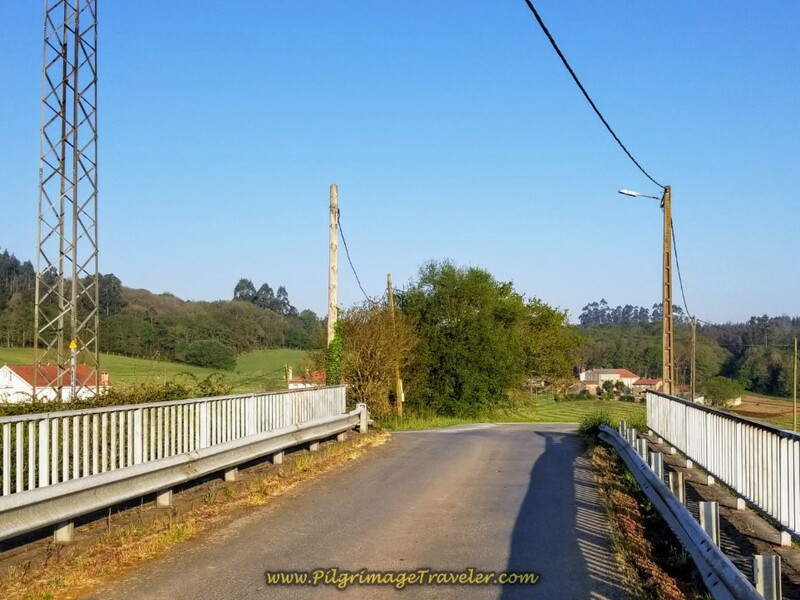 A few meters onward, bear right at the Y-intersection onto the Rúa dos Salgueiriños de Abaixo, shown below. Walk 400 meters onward until you come to a large roundabout with a prominent horse head statue, in next photo. Continue straight on at the roundabout. While walking on the hill above Santiago, I kept scanning the horizon for a view of the cathedral towers. I could not see them. Not yet. 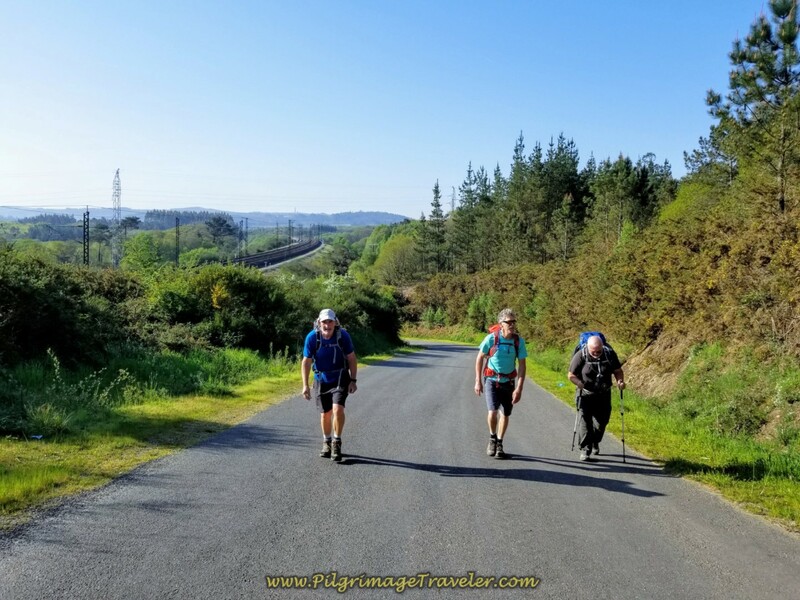 Continue on the Rúa dos Salgueiriños de Abaixo, descending steeply and around a bend for another 300 meters or so. Take a left hand turn by the old washing fountain, below, towards the McDonald's at the bottom of the hill. What an interesting juxtaposition of features, old and new! In about 150 meters come to a large roundabout. 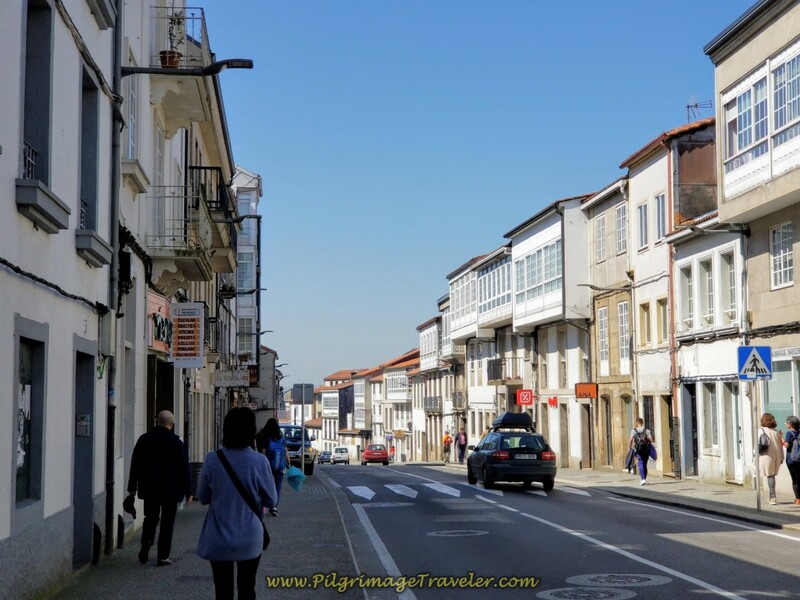 Cross the street, in front of you, the N-550 and pick up the street going southward, the Rúa de San Caetano. Walk 1/3 kilometer on the Rúa de San Caetano. 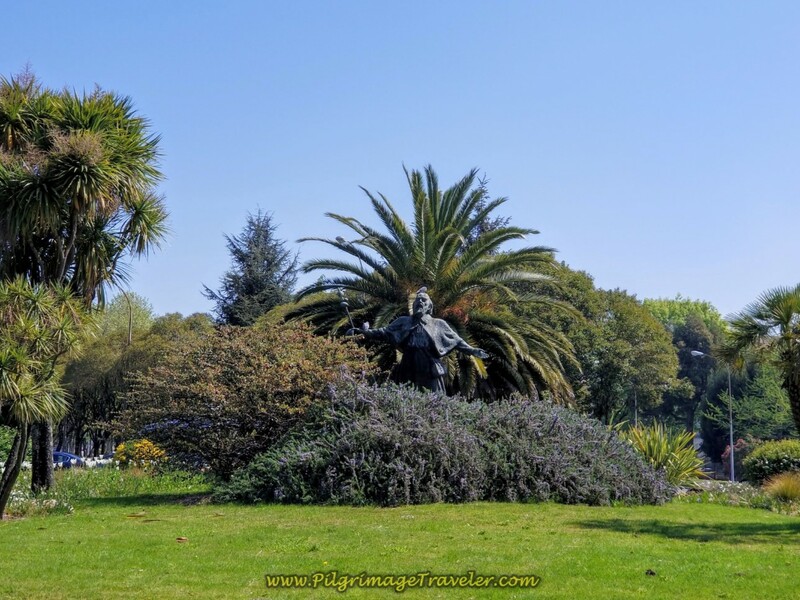 Walk by this long park, past the San Caetano Church in front of these government offices. FYI: The train station is just behind this building. 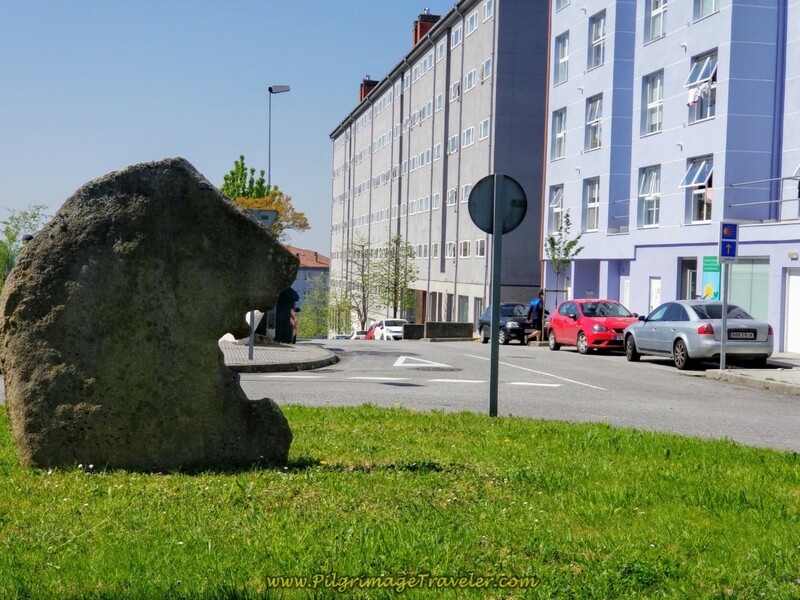 In another 400 meters, come to the next roundabout called the Praza da Paz. 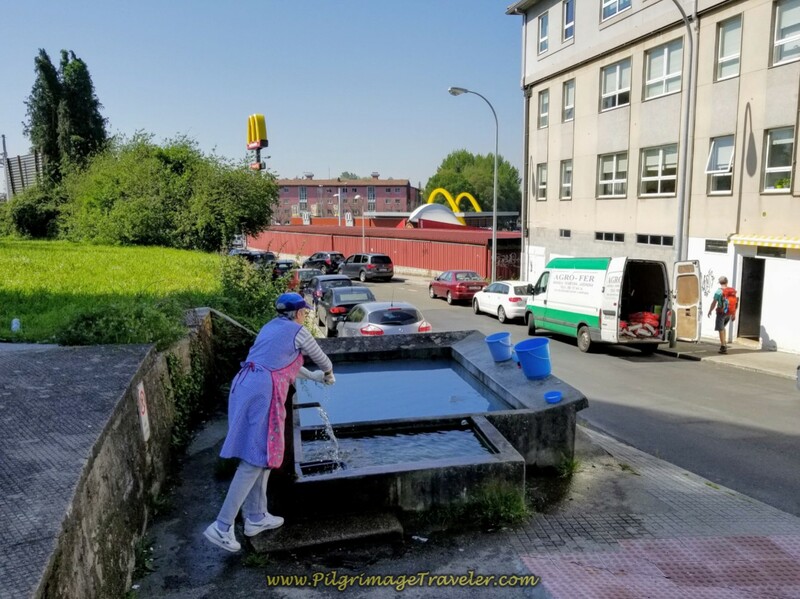 Deep within the Praza da Paz roundabout is a modern sculpture of a pilgrim, shown below. He is not easy to see for a south-bound walker, so you will need to look back as you reach the southern end of the circle as you go by. This lovely statue is on the cover of my eBook! I caught him this time with a pigeon sitting on his head! 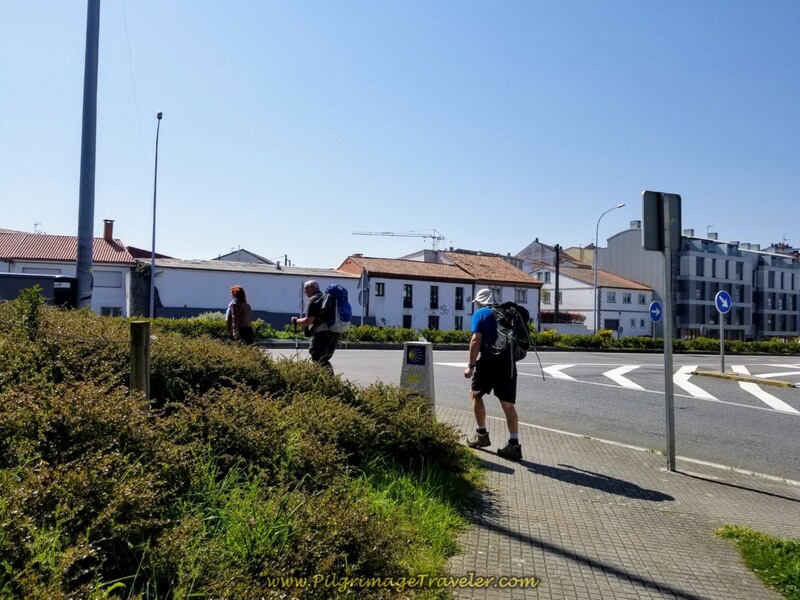 From the circle walk southwest down the Rúa da Pastoriza. In about 200 meters, you come to an old fountain on your right (not pictured) and this church on the left. 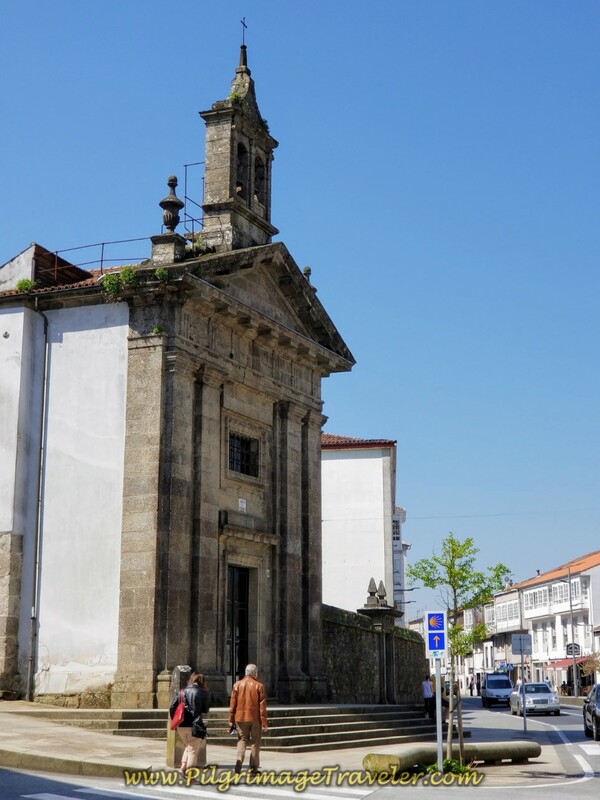 The Rúa da Pastoriza becomes the Rúa dos Basquiños, after the church pictured above. 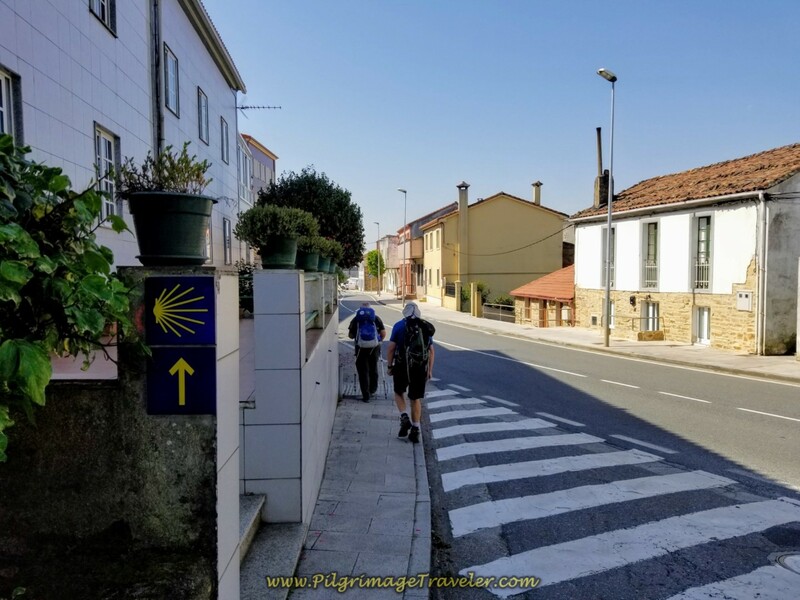 Walk along the Basquiños about 400 meters on day eight of the Camino Inglés, and as the street makes a bend, all of a sudden the twin cathedral towers come into view! 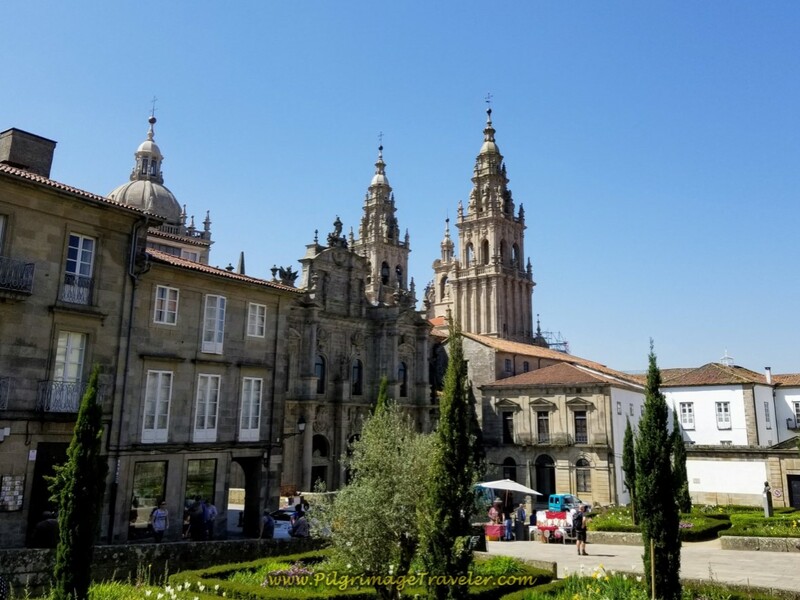 First Sighting of the Cathedral de Santiago Spires! 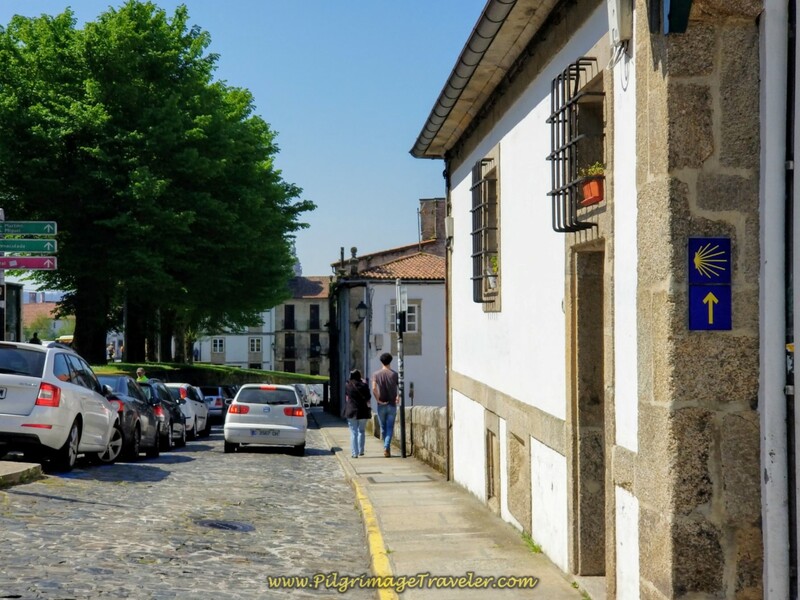 Walk along the Rúa dos Basquiños for a few more meters and see a sign post pointing the direction to Obradoiro Square! Almost there! 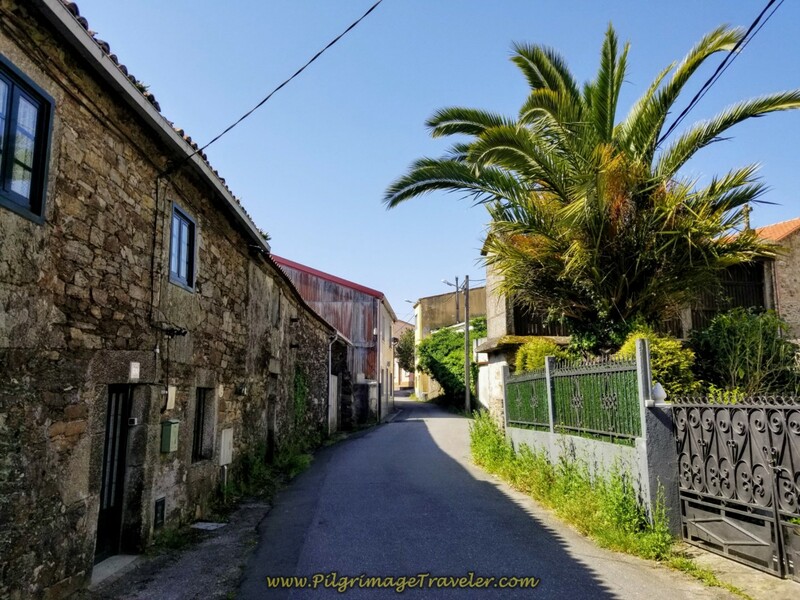 Turn right here onto the Avenida de Coímbra and immediately left onto the Rúa de Santa Clara, a quaint and narrow side street shown below. The Rúa de Santa Clara parallels the Rúa dos Basquiños for a short while and descends down a hill. 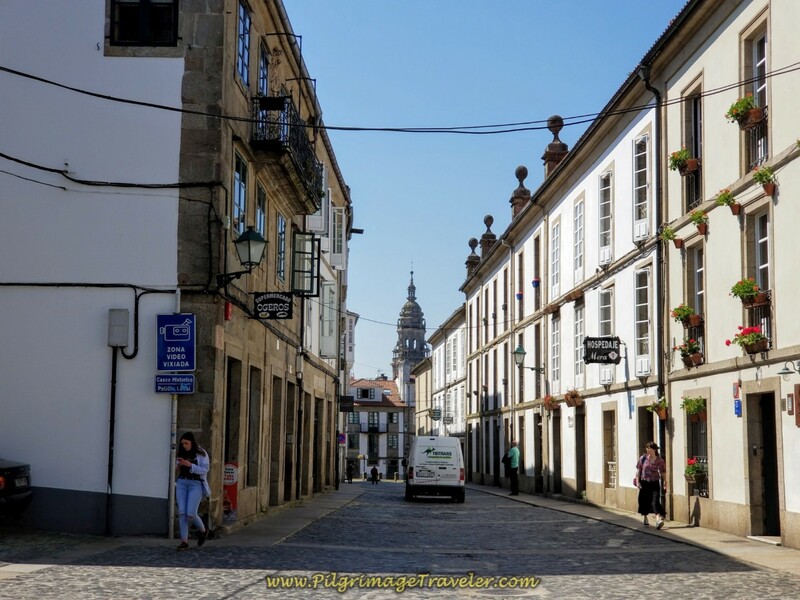 Pass by the Convento do Carme. You can easily see the Convento do Carme, from the Rúa dos Basquiños before you make your turn. If you head for the Convent you will know you are heading in the right direction. As you descend on the Rúa de Santa Clara, it takes a bend and becomes the Rúa dos Loureiros. Continue your descent on the Rúa dos Loureiros. You will catch more glimpses of the Cathedral of Santiago towers along the way. Here is the clock tower in the photo below. 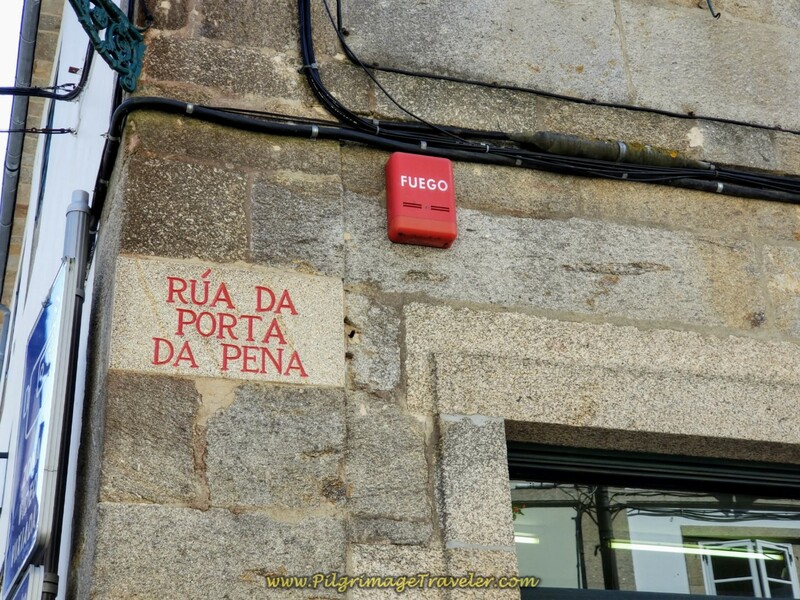 At this point you are now entering the pedestrian zone (zona peatonal) and the street becomes the historically important Rúa da Porta da Pena. 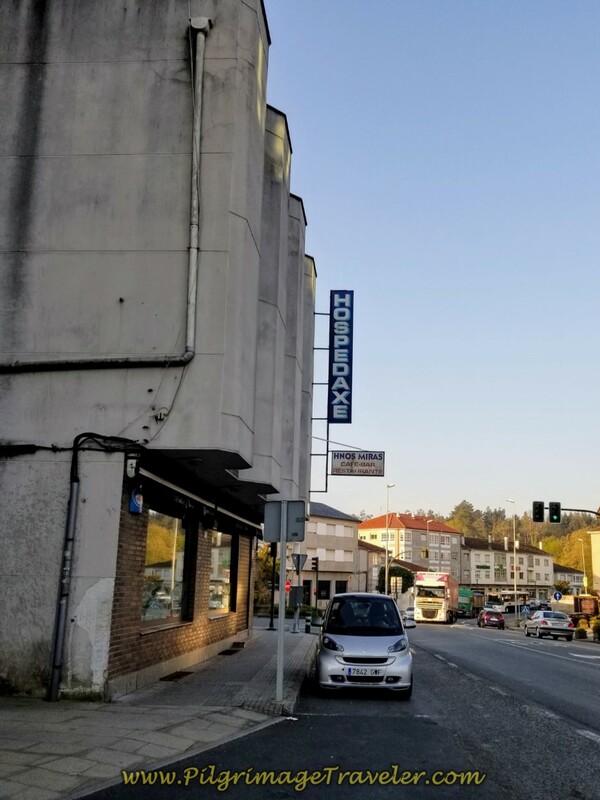 Look for the old street sign, on the stone building up and to your left as you enter the pedestrian zone. Around here is where the old original gate was to the medieval walled city of Santiago, called the Porta Poennae. 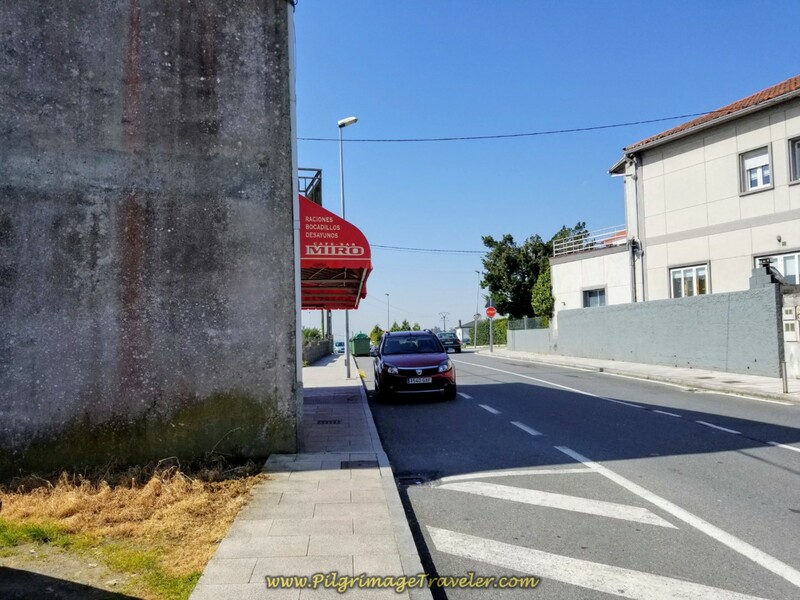 The modern street takes its name from this gate where pilgrims traveling on their final steps on the Camino Inglés traditionally entered the city. 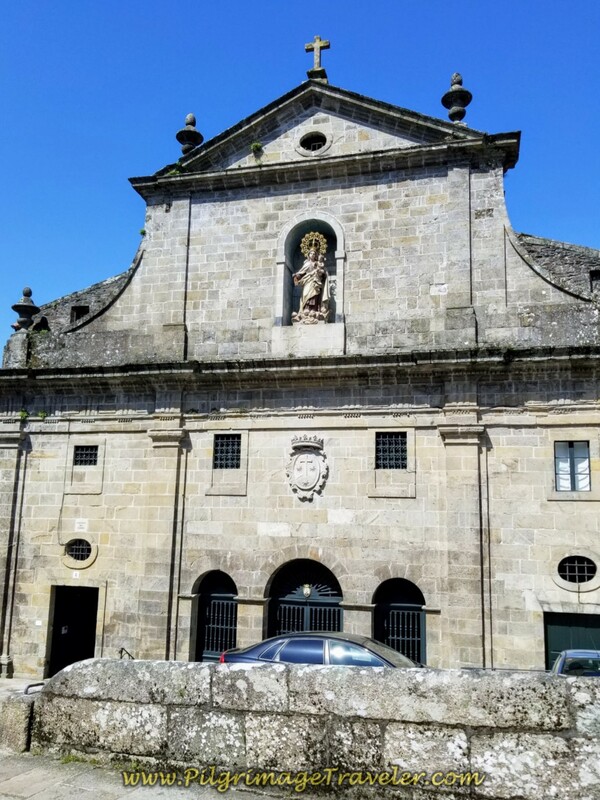 If you look to your right just before this gate, at the Mirador Costa Vella, (lookout), you will see the sweeping towers of the Convento de San Francisco de Santiago (view not pictured). You can descend the long flight of stairs to visit this splendid cathedral, if you desire, or save it for a later time! 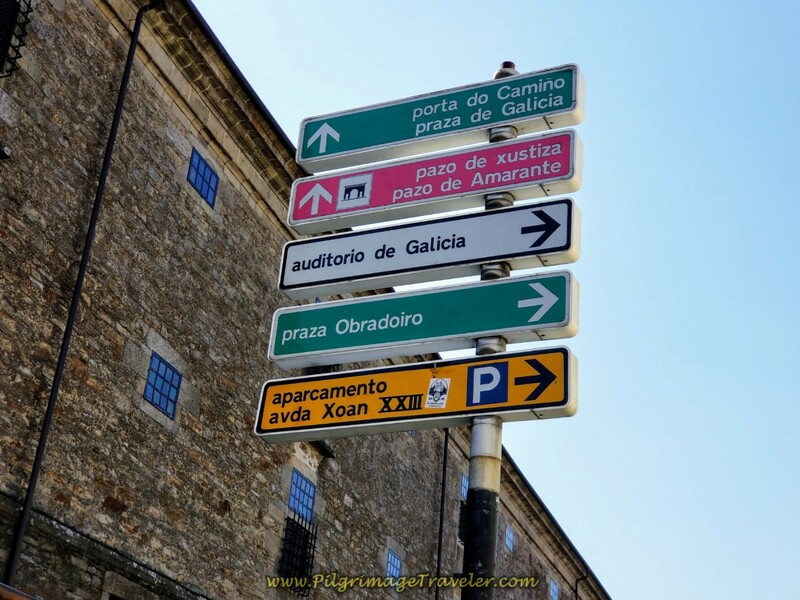 I know you are eager to get to the Santiago de Compostela cathedral! 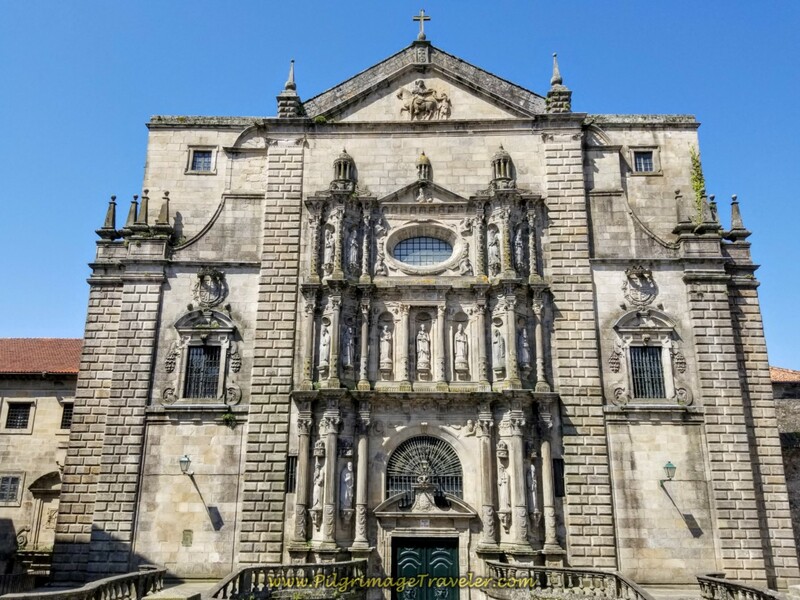 When you pass the San Francisco view point, you are entering the Rúa da Porta da Pena and the very heart of Santiago de Compostela! You are only feet away from the cathedral! 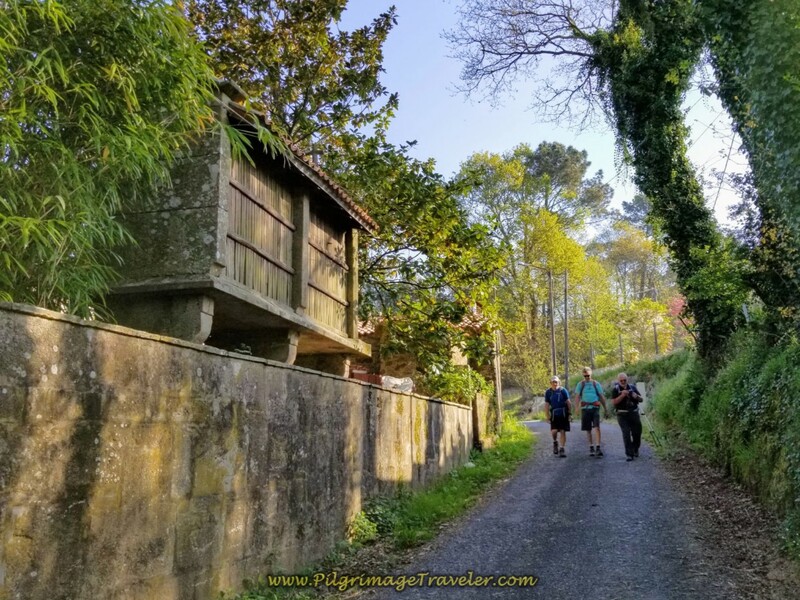 These are truly your final steps on your Camino Inglés on day eight! The Rúa da Porta da Pena becomes the Rúa da Fonte de San Miguel, here at this church in the Praza de San Martiño. It is a glorious edifice! I love this town! In a few meters when the the street ends, turn left at the T-intersection. 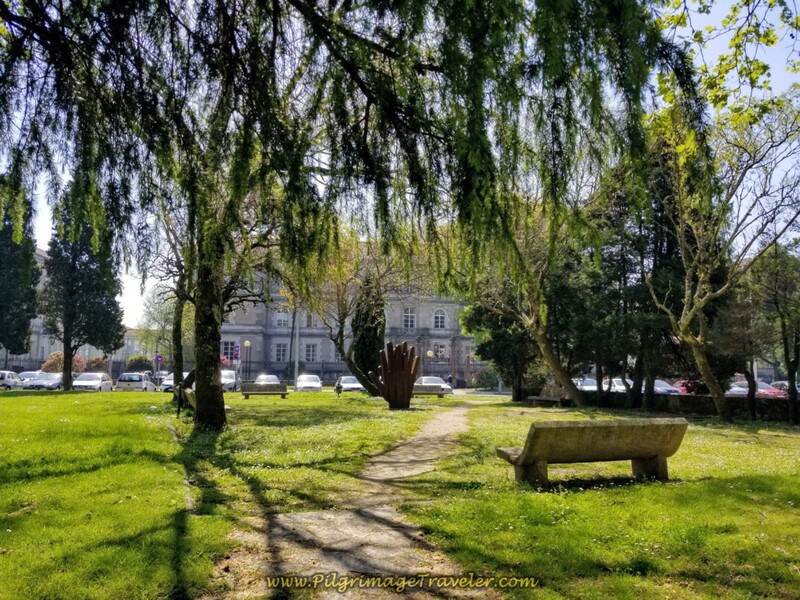 Continue on the street until it bends and leads you out to the beautiful Praza da Inmaculada coming into sight, with its beautiful formal gardens, shown below! Almost there! You will walk through the Praza da Inmaculada and past this northern side of the cathedral. Pause here to take in the astounding and sweeping view! 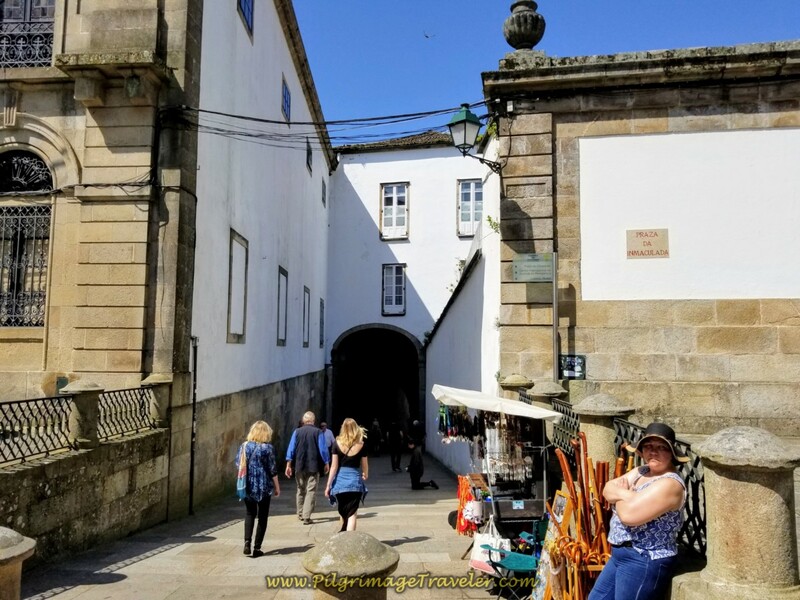 Then you keep on going through the tunnel ahead of you, called the Arco de Palacio and down the stairs to the famous and monumental Praza do Obradoiro! You have arrived, now do your victory dance! 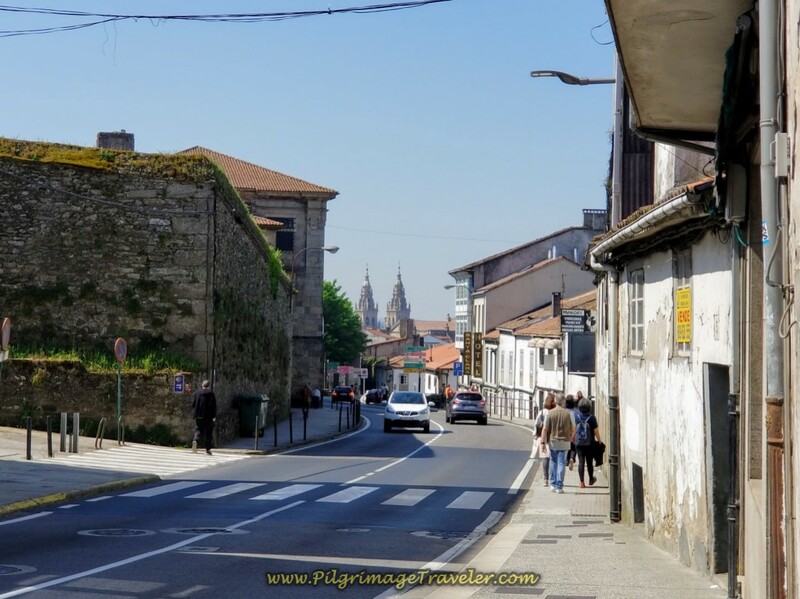 Through the Arco de Palacio to Obradoiro Square! 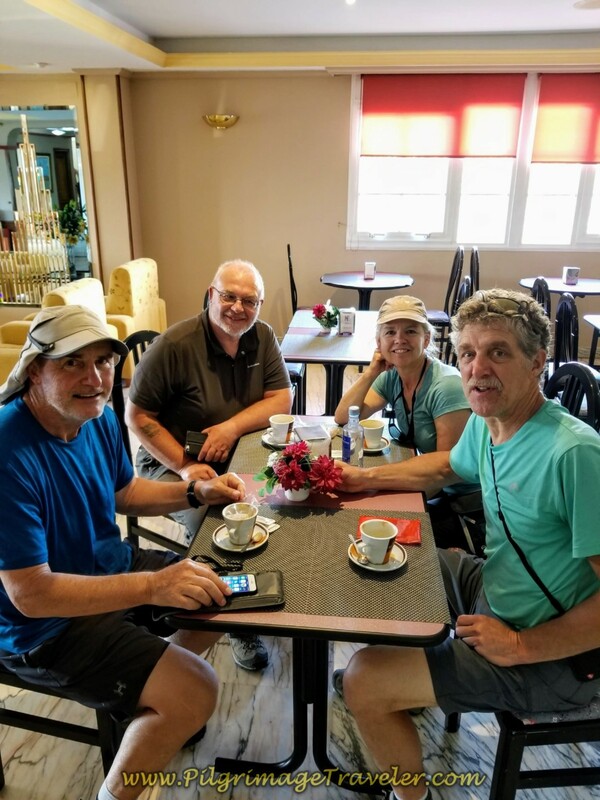 Rob, Elle, Steve and Rich, Happy Pilgrimage Travelers in Obradoiro Square! 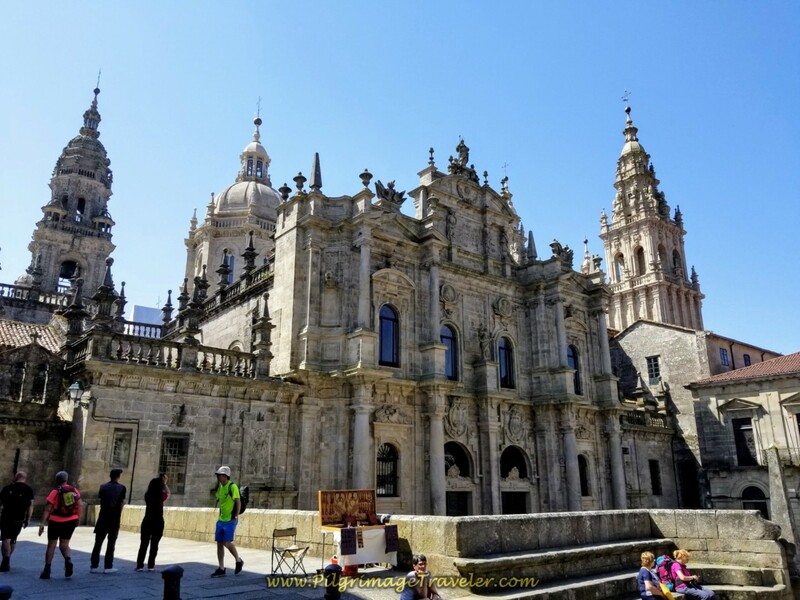 If you would like to learn more about the Cathedral of Santiago de Compostela, please see my article that describes the surrounding landmarks and plazas by clicking here. It is truly an amazing town. 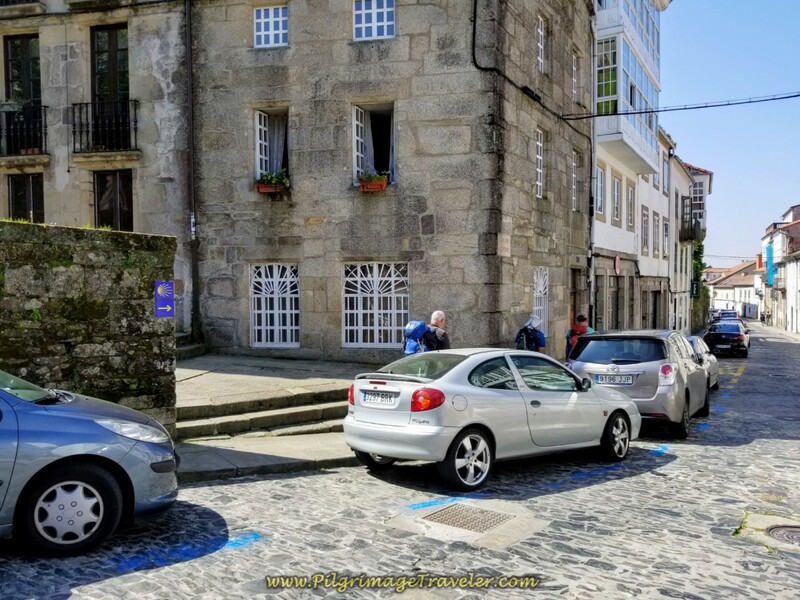 If you are looking for a place to book ahead in Santiago de Compostela, you can do so through clicking this link. I will earn a small commission if you book through this link. I thank you so much for your support! 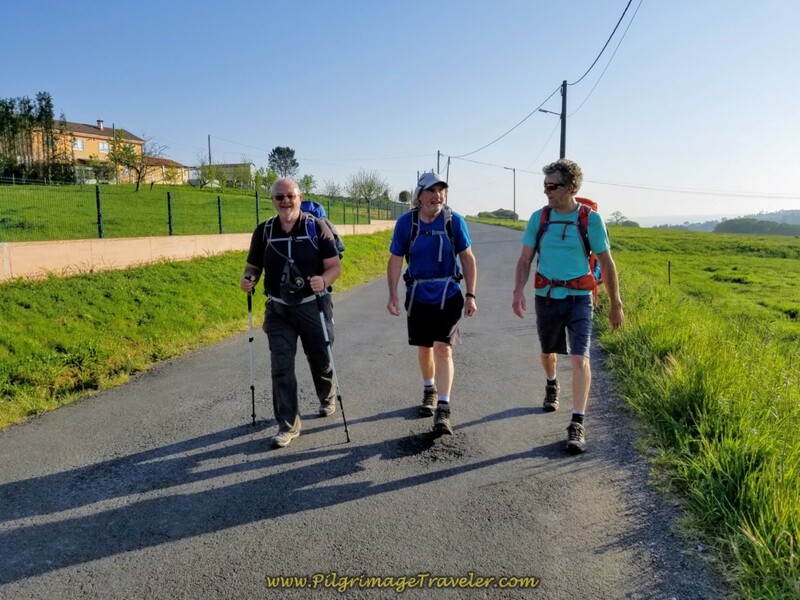 It was a privilege to walk with our old Camino friends, Steve from the UK and Rob from Australia. It was a sweet pleasure to arrive at the cathedral with friends and to share in the accomplishment. Especially for Rob, for whom he carried a special burden of his own on his back ~ Parkinson's disease. 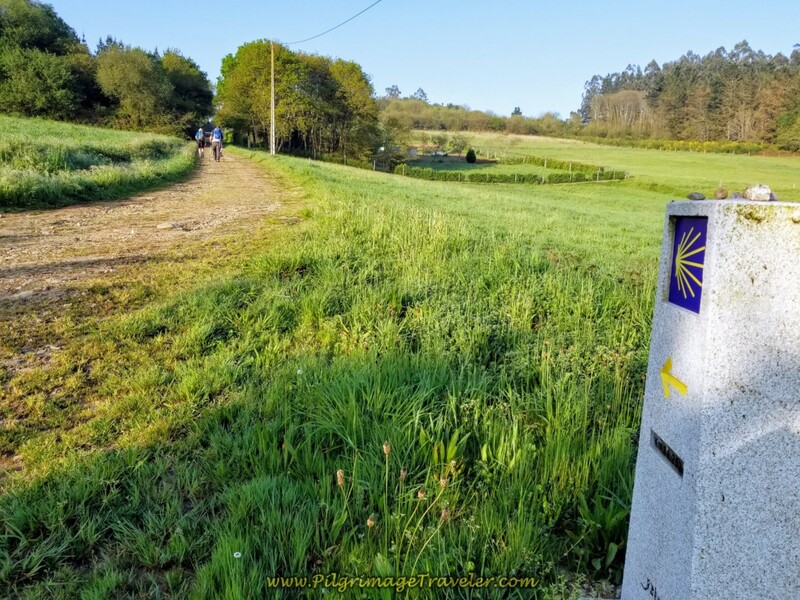 The final stage into Santiago de Compostela is not all that easy, and after pushing onward, Rob managed to do the Camino Inglés in six stages rather than the eight that I described. He maintained his integrity, because he was well prepared and has a strong soul. One step after another ~ taking only one step at a time ~ the secret to success. His spirit was so admirable. Perhaps we had a tendency to coddle him, perhaps we didn't coddle him enough. We may never know. And it really doesn't matter, because in the end, he conquered himself, one more time. For that, he can be forever grateful. And on this day eight of the English Way, we remembered nothing, as nothing mattered now that we had arrived! 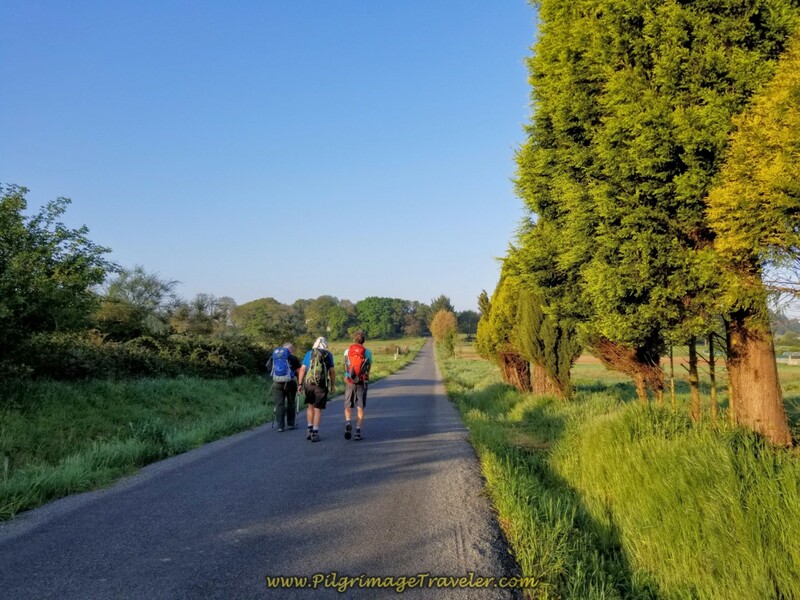 May your own steps, one after another serve you well on your Camino Inglés, on day eight, so that you are successful, arriving in Santiago de Compostela! 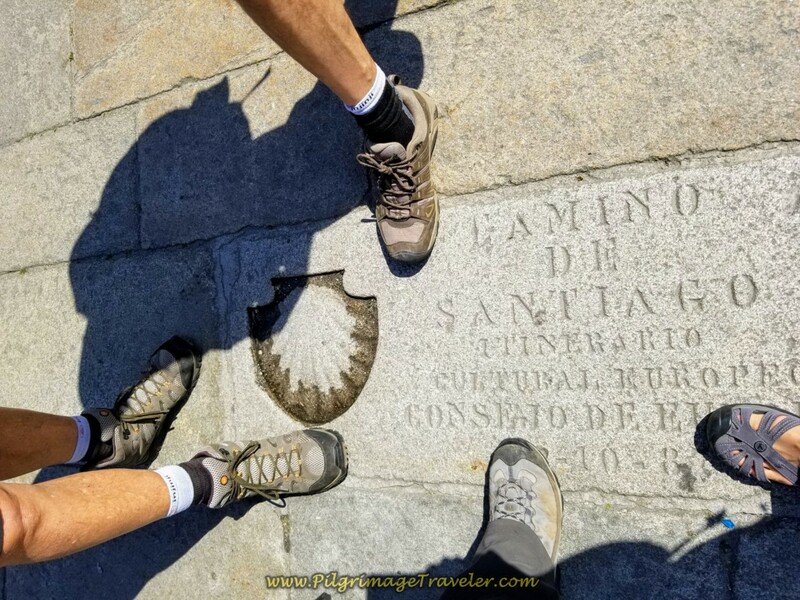 May your own final steps on your Camino Inglés be filled with rapture and awe as you enter this holy city that for centuries has been the goal of the pilgrimage traveler. 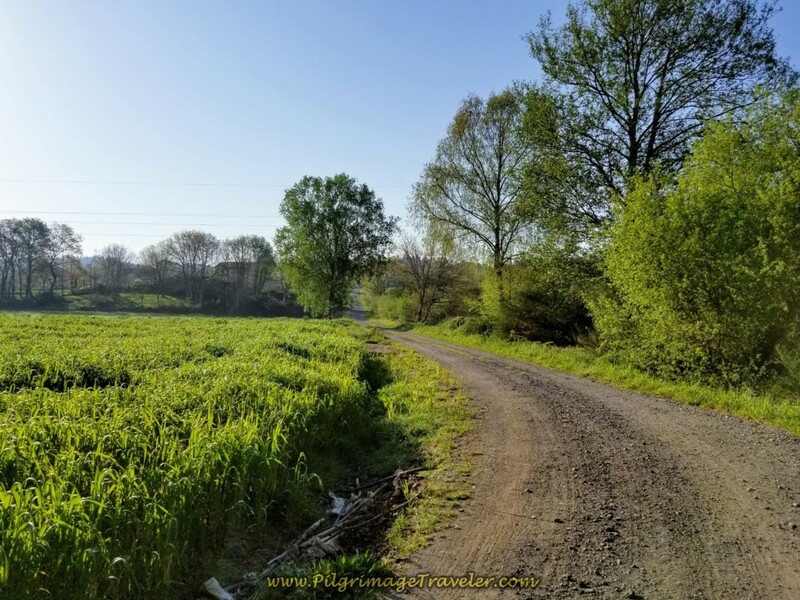 May you pause here like all the other pilgrims of yore and now, and know that you have completed your pilgrimage on the Camino Inglés and you truly have no destination at the moment because you have arrived!